3,607 km raced at an average speed of 41.654 km/hr, a new record speed. 189 starters and 155 classified finishers. 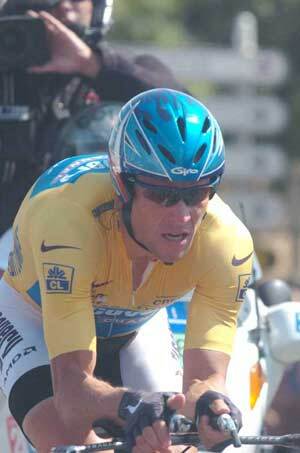 Lance Armstrong won his seventh consecutive Tour victory. His team's superiority was demonstarted in its clear stage 6 team time trial win. Despite its $23,000,000 budget, T-Mobile was ineffectual. In the first Alpine stage, T-Mobile could barely put one rider in the top ten. Armstrong announced his retirement after the Tour, which turned out to be temporary. 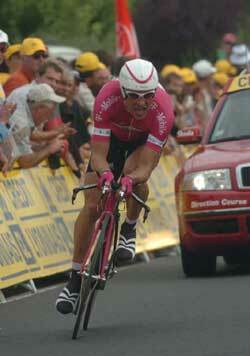 Armstrong was eventually stripped of all of his Tour titles from August 1, 1998 because of his doping. In February, 2012, as a result of his participation in the Operacion Puerto doping scandal, Jan Ullrich had all of his results dating from May, 2005 disqualified. This includes his third place in the 2005 Tour. First rider, Ludovic Turpin (Ag2r), off at 3:40 PM French time. Armstrong, the last one off, should roll out of the starthouse at 6:48 (9:48 AM PDT) and finish about 7:12 (10:12 AM PDT). All the riders will be set off at 1-minute intervals. Upper left: Zabriskie gets to wear the Yellow. Upper right, Armstrong put all doubts to rest. Lower left: Ullrich is starting off the Tour giving Armstrong a full minute. Where can he make that up? Pictures from Fotoreporter Sirotti. 1. David Zabriskie (CSC) 20min 51.840sec. Fastest Tour time trial in history (not including prologues). 54.676 km/hr! 15. Michael Rich (Gerolsteiner) s.t. 189 finishers, Leonardo Piepoli is the Lanterne Rouge. GC after stage 1. No time bonus this stage. 1. David Zabriskie (CSC) 20min 51.840sec. Climber (Polka Dot Jersey) No points awarded. 10:20 PDT: Armstrong finishes just a couple of seconds slower than Zabriskie, So Zabriskie wins the stage and the Yellow Jersey. 10:13: Armstrong steams right by Ullrich!!! What a display of power. 10:03. Armstrong went through the first check just a couple of seconds slower than Zabriskie but Ullrich is almost a minute slower. Wil Armstrong catch Ullrich? 9:50 PDT: Armstrong just took off. He pulled a foot out of the pedal just as he was exiting the ramp, but got cleated in immediately. Ullrich betrayed no nervousness in the starthouse. He looked lean. Iban Mayo isn't going well, turning in slow intermediate times. 9:26 PDT: with 137 riders in, no change in the top five. The big dogs are starting to ride. Hincapie and Bradley McGee are on the course now. 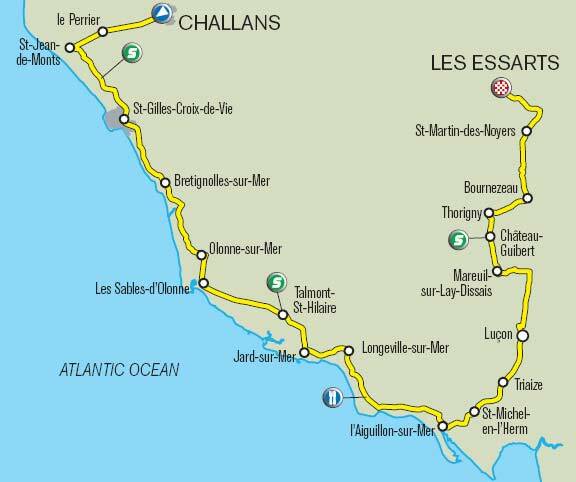 2- VINOKOUROV (T-Mobile) @ 53"
3- BODROGI (Credit Agricole) @ 59"
4- VOIGT (CSC) @ 1' 04"
5- KARPETS (Illes Balears) @1' 05"
Stage 2, Sunday, July 3: Challans - Les Essarts, 181.5 km. Weather: Sunny, 29C (84F). Humid. Above: Boonen is just starting to go by McEwen (yellow shoulders and helmet). 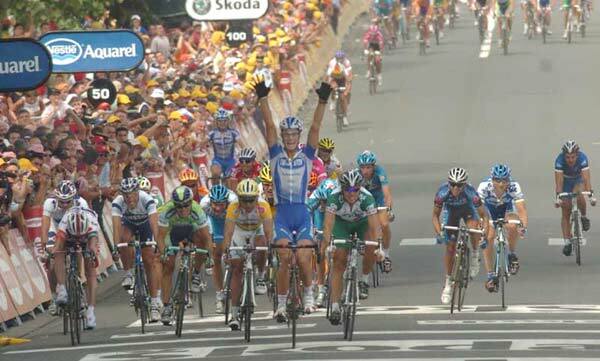 Below, Boonen gets his first leg up on his quest for the Green Jersey in Paris. Both photos from Sirotti. Results: All 189 riders finished. 3. 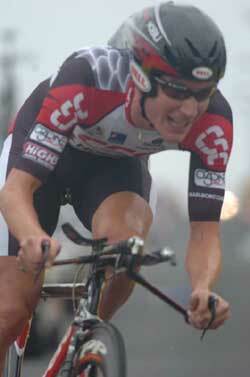 Robbie McEwen (Davitamon-Lotto) s.t. 6. Juan Antonio Flecha (Fassa Bortolo) s.t. 7. Peter Wrolich (Gerolsteiner) s.t. 8. Jerome Pineau (Bouygues Telecom) s.t. 9. Baden Cooke (FDJ) s.t. 10. Allan Davis (Liberty Seguros) s.t. 11. Manuel Quinzato (Saunier Duval) s.t. 12. Robert Hunter (Phonak) s.t. 13. Inaki Isasi (Euskaltel) s.t. 14. Yuriy Krivtsov (Ag2R) s.t. 15. Angelo Furlan (Domina Vacanze) s.t. 16. Maxim Iglinsky (Domina Vacanze) s.t. 17. Sebastien Hinault (Credit Agricole) s.t. 18. Anthony Geslin (Bouygues Telecom) s.t. 19. Jan Ullrich (T-Mobile) s.t. 20. Fred Rodriguez (Davitamon-Lotto) s.t. 7. Fabian Canellara (Fassa Bortolo) s.t. 19. Bradley McGee (FDJ) s.t. The Finish. Liquigas brings the speed to a white-hot pitch. In the final sprint Robbie McEwen went up the right hand side. Tom Boonen got a perfect lead out and blew by McEwen as did Thor Hushovd, for the win. Looks like McEwen ran out of gas. 4 km to go: Walter Beneteau (Bouygues Telecom) has a go. He has a small gap. He's caught. All together. Zaballa (Saunier Duval) tries to get away. It doesn't last long. Km 172: Erik Dekker attacks and gets a gap with Carlos da Cruz (FDJ) on his wheel. Da Cruz won't help. They get caught. The breakaway trio is holding on to their 13 seconds. OK, the break sits up. They are caught. All 189 riders are together. 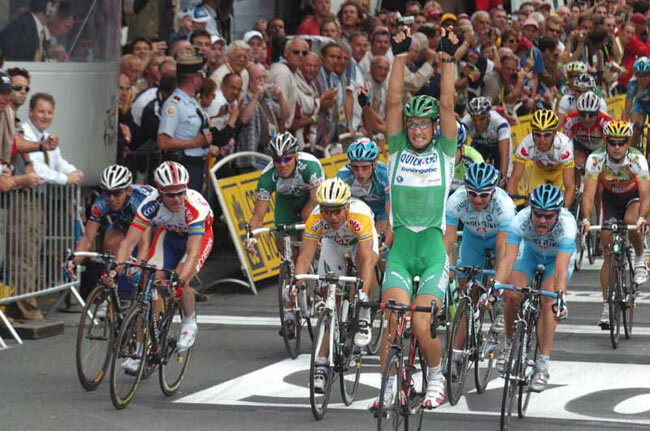 Armstrong in his green jersey is staying up near the front. Looks like a sprint finish. Km 167: Bodrogi gave up on the climb and has been caught by the peloton. The gap between the peloton and the breakaway trio is a little over 30 seconds. Cofidis and Domina Vacanze are at the front now as well. Km 160: The gap fell to under 1 minute. The breakaways are not surrendering. They are pushing themselves hard. They are on only the only rated climb of the day. The first to the top will get to wear the Polka-Dot climber's jersey. Canada attacks hard and gaps the other three. Ah, he's gone too early. Voeckler, the local who knows these roads, times it just right. He closes the gap and then goes by Canada after a slight rest on Canada's wheel. He easily takes the win and will get the Maillot Pois. Nicely done. Km 150: The riders rolled through the last of three intemediate sprints without contest. Bodrogi got the 6 bonus seconds for winning it. He also got the 2nd intermediate sprint, so he has moved up in GC to third place, displacing Vinokourov from the podium. Voeckler in the break looks sharp, animated and is working hard. Even though the gap is coming down, now 1min 50sec, the break is moving fast and still working well together. Km 138. The break looks doomed. The gap is 2min 15sec with more than 40 km to go. There was a crash in the peloton, but everyone is up and chasing. The roads the Tour is using in this area of France called the Vendee are often very narrow. Km 126: The gap is down to 3min 5sec. The breakaways seem to working well together and sharing the burden of the escape. Km 112: The gap dropped under 4 minutes as FDJ and Davitamon-Lotto has joined in the chase to bring back the break. The peloton is strung out as the speed increases. Km 104: Quick Step is starting to help CSC. They are thinking about getting a stage victory for Tom Boonen. 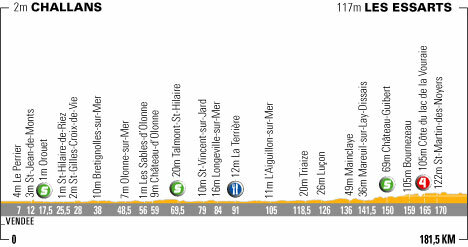 The race is now at the city of L'Aiguillon-sur-Mer and is turning inland. They've had a tailwind so far. Now they will have a head or crosswind from the left. The gap is 4 minutes 10 seconds to the 4 breakaways. With the higher speeds of the final kilometers it will get tough for some of the smaller riders. Km 87: CSC is lined up like a team team trial working the front of the peloton. Zabriskie in Yellow is sitting 6th in the line. The gap to the 4 breakaways is about 4 minutes. Believe it not, there was a time when a man the size of Magnus Backstedt could win the Tour de France. Francois Faber, winner of the 1909 Tour, weighed 91 kg. He never won again because in 1910 the Tour introduced high mountain passes in the Pyrenees. Km 78: The gap of the 4 breakaways is 3min 40sec. The big question is being answered. CSC is at the front working to limit the gap. At times all 9 CSC riders have been at the front. They are defending Zabriskie's Yellow Jersey. Km 28: A break of 4 emerged from an earlier break of 14. They are: Laszlo Bodrogi (Credit Agricole), 5th in GC at 59", Thomas Voeckler (Bouygues Telecom), 131st at 2'48" (Voeckler got and kept the Yellow for a long time last year by taking advantage of an opportunistic break, David Canada (Saunier Duval), 137th at 2'52", Sylvain Calzati (Ag2R),155th at 2'59". Some interesting statistics were released by the Tour organization as a result of the pre-Tour medical exams. Stage 3, Monday, July 4: La Châtaigneraie - Tours, 212.5 km. Weather: 18C (64F) with a chance of rain. The streets are dry at the start. 2. Peter Wrolich (Gerolsteiner) s.t. 4. Bernhard Eisel (FDJ) s.t. 5. Allan Davis (Liberty Seguros) s.t. 7. Magnus Backstedt (Liquigas) s.t. 8. Anthony Geslin (Bouygues Telecom) s.t. 9. Thor Hushovd (Credit Agricole) s.t. 10. Angelo Furlan (Domina Vacanze) s.t. 11. Isaac Galvez (Illes Balears) s.t. 12. Guido Trenti (Quick Step) s.t. 13. Gianluca Botolami (Lampore) s.t. 14. Luciano Pagliarini (Liquigas) s.t. 15. Daniel Becke (Illes Balears) s.t. 16. Manuel Quinzato (Saunier Duval) s.t. 17. Juan Antonio Flecha (Fassa Bortolo) s.t. 18. Gerrit Glomser (Lampre) s.t. 19. Fred Rodriguez (Davitamon-Lotto) s.t. 186. 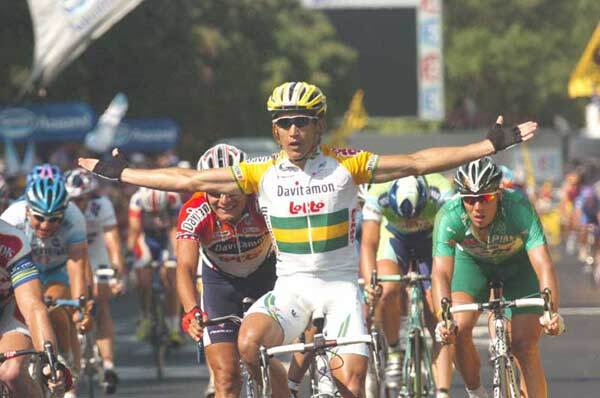 Robbie McEwen (Davitamon-Lotto) s.t. Was third but relegated for irregular sprinting. 16. Michael Rich (Gerolsteiner) s.t. 20. Bradley McGee (FDJ) s.t. The Finish. Quick Step then Liquigas and then Credit Agricole hit the front. Boonen took over and led it out, with McEwen trying to go through a hole that wasn't there, bumping into Stuart O'Grady. O'Grady didn't budge. Boonen made it through the pack and then just pounded it out in a long drag race and took a clean win. 1 km to go. Cancellara is caught. It's all together for a sprint finish. 3 to go. Dekker and Portal keep driving. What a pair of athletes! 5+ seconds. They're caught. Fabian Cancellara takes off. 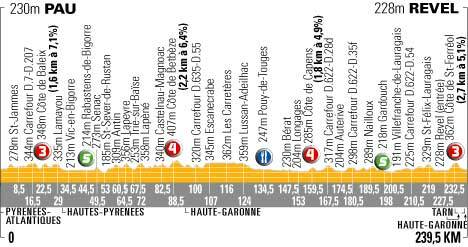 7 to go: The race is in Tours. The pack is completely stung out in single file. 15 seconds. 11 to go: The peloton doesn't seem to have a real impetus. It seems to have slowed. 16 seconds between the pack and the leaders. 13 to go: The peloton can see the lead trio. It's about 33sec. The leaders have been away since the 27th kilometer. Bertogliati has sat up and is caught. 15 km to go: The gap is 45sec. Dekker is driving hard. Km 186: The gap is 1min 15sec. Dekker isn't giving up. Credit Agricole is helping Davitamon-Lotto with the chase. The road gets spooky-scary narrow as it goes through a little town (Chielle?). There are hay bales funneling the riders through one narrow point and some riders have to go off the road as too many riders try to get through the skinny road at one time. The pack is hauling now. Km 179: Dekker takes the final climb and will get the KOM polka dot jersey. It looked like Bertogliati gave it a bit of effort and then just let Dekker have it. Km 175: The peloton is going 52 km/hr with the tailwind. The gap is 1min 41sec. They should make it to the third climb and Dekker may spend the night in dots. 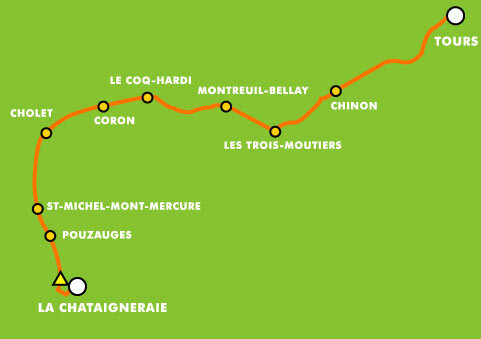 Km 162: Dekker easily took the Chinon climb from Bertogliati. The gap is at 1min 55sec. He'll do what he can to stay away until the last climb and probably get the KOM jersey from Voeckler. Km 144: Bouygues Telecom is workng the front hard. They don't want the lead trio to grab the climbing points, thereby protecting Thomas Voeckler's KOM lead. The gap is down to 1min 44sec. The chase eased a bit while several members of the peloton, including Armstrong, took a chance to take a pee break. Km 136: The gap is still coming down. It's now 2min 48sec. the average speed for the third hour was 44.9 km/hr. The average for the day so far is 44.3 km/hr. Km 125: The gap is down to 3min 30sec. The peloton is looking a little strung out. The breakways are looking good. Dekker and Portal are riding on the handlebar drops while Bertogliati is on the tops. T-Mobile and Fassa Bortolo have a few riders up front now as does Rabobank. Rabobank won't be helping in the chase with their man Dekker off the front. The peloton is back to being a compact mass. Km 115: The collective effort has had its effect. The gap is now down to 4min. The clouds look threatening, but so far, the rain has held off. Km 103: The gap has grown to 5min 30sec. Quick Step and Davitamon-Lotto have joined the chase. Km 94: The gap is up to 5 min. CSC is at the front of the peloton but they aren't killing themselves. They just have to keep the trio of Dekker, Portal and Bertogliati within a catchable distance until the sprinter's teams take over at some point in the second half of the stage. Quick Step will surely want to keep Tom Boonen in Green. The average speed for the second hour was 45.4 km/hr. The first two hours have averaged 44 km/hr. Km 82: A little after the 27th kilometer 2 riders escaped: Erik Dekker (Rabobank) and Nicolas Portal (Ag2R). They were joined shortly by Rubens Bertogliati (Saunier Duval). They now have a gap of 4min 20sec. The winds are from the peloton's back. After the first hour the average speed was only 42.6 km/hr. Current Polka Dot jersey holder Thomas Voeckler went for the points on the first climb at Km 33, but Fabian Wegmann beat him to the punch. Stage 4, Tuesday, July 5: Tours - Blois 67.5 km Team Time Trial. Dueling teams. Above, Discovery. Below, CSC before disaster struck Zabriskie. Both photos by Sirotti. Weather: 21C (69F). Tailwind. Little cotton puffs of clouds in the sky. Could rain late in the day. 10. Ivan Basso (CSC) s.t. 12. Pavel Padernos (Discovery) s.t. 15. Carlos Sastre (CSC) s.t. 8:07: In Blois with 1.5 km to go Zabriskie crashed!! The team has to continue. Zabriskie has to finish alone. 4- LIBERTY SEGUROS @ 4sec"
8:04: Discovery is still intact. they went throught the 61.5 km checkpoint in first place with 24 seconds faster than T-Mobile. CSC still to come through. 7:50 AM: It's still really tight at the 45.8 km checkpoint. Zabriskie is still in Yellow. Armstrong is taking nearly 1/2 km pulls. Phonak has lost 3 men. That's going to cost them. 7:20 AM: Liquigas has posted a new fastest time, 6 seconds faster than Davitamon. After Discovery and CSC go through the first intermediate time check at Km 25 we'll post those results. Through the 25 km and 45.8 km checkpoints Liberty Seguros is currently leading. 6:55 AM PDT: Discovery takes off. Like everyone else, they're doing a single pace line. 6:00 AM PDT. FDJ took off. They have rear discs as well with spoked aero front wheels. Bradley McGee was their first man to lead the pace line. So far it looks like everyone is riding single pace lines. Cofidis is on the road. They have rear discs and front deep section spoked front wheels. They are riding a single pace line. I counted out about an 18-second pull for one lead rider. The Tour has a complex set of rules regarding how much time a rider can lose in the Team Time Trial. To keep it simple, the maximum is 3 minutes. Lots of American writers have gone on about how this "new" rule has been put in place to deprive Armstrong and Discovery of the real fruits of their superiority. There may be elements of truth here. But the fact is that "stop-loss" rules in team time trials has a long history in the Tour. It prevents a good rider from having his Tour chances ruined by being on a weaker team. This goes to the core of Tour DNA. Tour founder Henri Desgrange wanted the Tour de France victor to win by the virtues of his own talents as much as possible. The teams will depart in reverse order of their Team General Classification standing. Euskaltel goes first and the rest follow in 5-minute intervals. The teams will get the time of the fifth rider crossing the line. CSC should finish about 8:18 AM PDT. 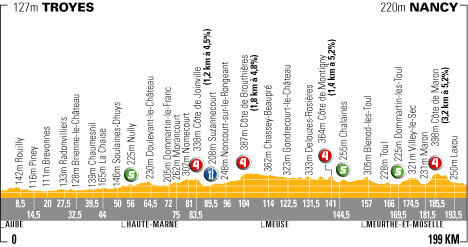 Stage 5, Wednesday, July 6: Chambord - Montargis, 183 km. Robbie McEwen times it perfectly for his stage 5 win. Tom Boonen in green is just on his right. Picture from Fotoreporter Sirotti. Weather: it was 16C (60F) at the start. The air is a bit unstable and it is raining off and on at the finish line. There is a stiff tailwind. 1. Robbie McEwen ( Davitamon- Lotto) 3hr 46min. Average speed of 48.584 km/hr. 5. Angelo Furlan (Domina Vacanze) s.t. 6. Allan Davis (Liberty Seguros) s.t. 7. Bernard Eisel (FDJ) s.t. 8. Baden Cooke (FDJ) s.t. 9. Jens Voigt (CSC) s.t. 10. Robert Forster (Gerolsteiner) s.t. 11. Jean-Patrick Nazon (Ag2R) s.t. 12. Daniel Righi (Lampre) s.t. 13. Maxim Iglinskiy (Domina Vacanze) s.t. 14. Laurent Brochard (Bouygues Telecom) s.t. 15. Peter Wrolich (Gerolsteiner) s.t. 16. Daniel Becke (Illes Balears) s.t. 17. David Loosli (Lampre) s.t. 18. Oscar Pereiro (Phonak) s.t. 19. Jerome Pineau (Bouygues Telecom) s.t. 20. Massimo Guinti (Fassa Bortolo) s.t. 1. Lance Armstrong (Discovery) 13hr 45min 12sec. 48.242 km/hr average speed over the 663.5 km covered over the first 5 stages. The Finish: Cofidis and FDJ kept the speed high and the pack went through the final right hander without trouble. In the final rush to the line is looked like FDJ's Berhard Eisel was leading it out. Then Boonen went for it with McEwen on his wheel. McEwen timed the drag race perfectly and this time McEwen got it by the length of half a wheel. Robbie McEwen wins stage 5. 5 km to go: Quick Step is stepping on the gas. They are really moving fast. Some riders overshot the hard right at 4 to go and crashed. Km 170: The break is caught. It's all together. The teams are trying to get control. Cofidis, Credit Agricole, Davitamon and Quick Step are up front with Quick Step having the most bodies up there. The big GC men are up front as well, wanting to keep out of trouble. 15 km to go: 26 seconds. Now it's 22 seconds. Armstrong is staying up near the front with a few Discovery deputies by him for protection. Km 161: It's 35 seconds. The break keeps working. The sun has come out. With the hard right turn with 500 meters to go in the final sprint, it would be good to have dry streets. It's going to be dangerous enough. Km 153: Ag2R has also moved to the front of the peloton. They want a win from their sprinter Jean-Patrck Nazon. The quartet has 1min 13sec. Km 138, 44 to go: The gap is now 1min 30sec. Commesso took the final intermediate sprint. Little drops of rain are falling again. Km 126: The gap is 3 minutes. The was some rain on the race, but it has stopped. Boonen's Quick Steps and McEwen's Davitamons are at the front working hard. I see a white FDJ jersey at the front as well. Km 109: At the base of the Bellevue climb there was some agression in the break. It looked like Commesso was refusing to work and so Flecha stopped working as well as they slowed and talked. Finally Commesso took after the other two with Flecha chasing. After the climb, taken by Bodrogi, they came back together. That bit of nonsense cost them. The gap is now down to 3min 10sec. Km 93: Flecha appears to have eased a bit to let the others catch him. They are now a quartet with a 3min 30sec lead. At one point the gap had been over five minutes. The sprinter's teams are coming to the front to help Discovery chase the break. The race is moving very fast. The first hour's racing covered 52 km. Km 72: Juan Antonio Flecha (Fassa Bortolo) escaped a little before the 30 km mark. Erik Dekker tried to go after him, but was caught. Now three riders are chasing him: Kjell Carlstrom (Liquigas), Salvatore Commesso (Lampre) and Laszlo Bodrogi (Credit Agricole). Flecha has about 3 minutes on the peloton and is not waiting for the chasing trio who are about two minutes behind him. Because Armstrong became the race leader as a result of Dave Zabriskie's crash he didn't want to wear the Yellow Jersey today. After the end of the neutral part of the start the race was stopped. Lance had started in a regular Discovery jersey and race officials had him don the Yellow. He pulled it on over his Discovery shirt. Lemond and, I believe Merckx (after Ocana's crash on the Col de Mente in 1971), have refused to wear the Yellow Jersey after getting it as a result of another rider's misfortune. Zabriskie started despite his bruises and cuts. He has no broken bones. Zabriskie still doesn't know why he crashed. All 189 of the original starting riders started the stage today, but Constantino Zaballa (Saunier Duval) has abandoned. He's the first to do so. Tom Boonen won the first intermediate sprint for another 6 points. Stage 6, Thursday, July 7:Troyes - Nancy, 199 km. Weather: 17C (62F) and raining lightly with a tailwind. Lorenzo Bernucci prevails on a wet, dangerous course. 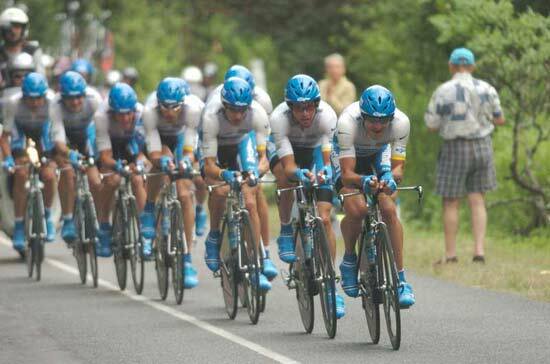 Vinokourov is on the right in the light blue Kazakh national champion's colors. Sirotti photograph. Results: With the crash happenng within 3 km to go, it did not affect the GC times. 4. Angelo Furlan (Domina Vacanze) s.t. 6. Kim Kirchen (Fassa Bortolo) s.t. 7. Gianluca Bortolami (Lampre) s.t. 8. Egoi Martinez (Euskaltel) s.t. 9. Gerrit Glomser (Lampre) s.t. 10. Kurt Asle Arvesen (CSC) s.t. 11. Laurent Brochard (Bouygues Telecom) s.t. 12. Jerome Pineau (Bouygues Telecom) s.t. 13. Massimo Giunti (Fassa Bortolo) s.t. 14. Oscar Pereiro (Phonak) s.t. 15. Xabier Zandio (Illes Balears) s.t. 16. Bobby Julich (CSC) s.t. 17. Pieter Weening (Rabobank) s.t. 18. Erik Dekker (Rabobank) s.t. 1. Lance Armstrong (Discovery) 17hr 58min 11sec. Average speed of 47.997 km/hr over the 862.5 km ridden so far. 11. Pavel Padrnos (Discovery) s.t. 14. Carlos Sastre (CSC) s.t. The Finish: The rider who went with Vinokourov was Lorenzo Bernucci (Fassa Bortolo). He went by Vinokourov in the corner and kept on going. Vino couldn't close the gap. Bernucci gets the win and Vinokourov is second. Lots of big name riders were caught in the crash including Robbie McEwen and Tom Boonen. As they limp in to the finish Rodriguez, McEwen and Boonen are discussing the situation, looking angry and disgusted. Vinokourov helped his cause a lot with the time bonus and gap to the field. 1 km to go. Damn! Mengin slides and crashes in a hard right hand corner. Vinokourov has help and keeps on going. the peloton piles up on the crash at the corner as they come through. 2 Km to go: Vinokourov takes off! The sprinter's teams have not taken control of this race. 4 km to go: Mengin still has at least 16 seconds. The pack has split in half. Km 190: Liquigas' Dario David Cioni has taken off after Mengin. It's dicey as the riders go around the corners with the painted white stripes. Km 185: The break broke up on the climb. It started with Kroon and Auge playing sprinter's games each wanting the other guy to take the lead on the climb. They came off as the remaining trio continued. Then Gerosa came off. Then Kirsipuu cracked. Mengin, the local boy is continuing. As the pack hit the climb riders in the peloton were shelled. Thomas Voeckler came off very early. Lots of other riders are comong off. The high speed of the last several days has taken its toll. The pack has caught Kroon and Auge. CSC is now at the front. Bobby Julich is working the pointy part of the peloton. Now Gerosa and Kirsipuu are caught. Mengin is away alone with 30 seconds with 10 km to go. Km 180: A little before the final climb. The gap is still 1min 26sec. Cofidis big dog Sylvain Chavanel flatted and is chasing alone. Tough time for him with the field moving so fast. Km 161: The gap is is just a tad under 3 minutes. Armstrong is taking off his rain jacket. Probably expecting some hard attacks on the final climb (km 185). But, did the pack let the lead quartet get too much time? Might they make their flight stick? Lots of flat tires in the rain since objects can stick to the tires. Basso was the latest victim. He got help from some teammates and is back on. With the high speed, the pack is under stress. Echelons are forming as the crosswind is making things tough for the guys in the back of the pack. Km 141: Kroon, Dekker's teammate and Auge battled it out for the points at the top of the Côte de Montigny. Kroon took it. Then, they both smiled at each other, bumped fists. I am pretty sure Karsten Kroon (Rabobank) is the new vitual owner of the Polka Dot Jersey. Both Kroon and Auge have 7 points. The average speed for the third hour is 45.1 km/hr. The average for the three hours is a quick 47.5 km/hr. The gap is 4min 12sec. Km 134: The gap has fallen below 5 minutes. It's 4min 45sec. The front of the peloton is mostly Quick Step and Davitamon, all taking really hard pulls. It's still raining, getting harder, in fact. Now the gap is 4min 30sec. Km 121: Kirsipuu, one of the breakway riders, flatted. He got back on with no trouble. Their lead is down to 5min 37sec. We've had another abandon. Fassa Bortolo's Claudio Corioni has quit the Tour. No news yet as to why. Zaballa, the first abandon, had to quit with knee troubles. Km 112: It looks like a dreary, wet day. The peloton is strung out. Domina Vacanze is helping out with the chase. Lots of teams have hopes for sprint-finish glory so the break has a lot to fight against. The gap is down to 6min 20sec. As the break goes through a little town the riders take the corners very carefully around the corners on the slippery, wet streets. The guys at the front of the peloton are riding hard. Stephan Auge has managed to gain 5 climbing points while in the break. He is now threatening Dekker's ownership of the polka dots. Dekker is leading with 6 points. There are two more rated climbs to go so he may wrest the lead in the climbing competition from Dekker. Km 105: Davitamon-Lotto and Quick Step have decied to bring the break back. The gap is already down to 7min 30sec. Again, these guys are moving very fast. For the first two hours the average speed is 48.7km/hr. Stage 7, Friday, July 8: Lunéville - Karlsruhe, 228.5 km. Two rated climbs. I think this is the first stage with a category 3 climb in this Tour, Armstrong noticed that lots of riders got shelled on the 4th category Maron climb on Thursday. He said that the very high speed of this Tour has already taken its toll on the riders. The guys are getting tired. Weather: 15C (59F). Rain overnight but the streets are dry right now. Again Robbie McEwen combines perfect timing with blazing speed for the stage 7 win. Big Magnus Backstedt is on his left. Sirotti photo. 1. Robbie McEwen (Davitamon-Lotto) 5hr 3min 45sec. 45.135 km/hr average speed. 2. Magnus Backstedt (Liquigas) s.t. 4. Gerrit Glomser (Lampre) s.t. 6. Fabian Cacellara (Fassa Bortolo) s.t. 7. Tom Boonen (Quick Step) s.t. 8. Gianluca Bortolami (Lampre) s.t. 10. Juan Antonio Flecha (Fassa Bortolo) s.t. 11. Stuart O'Grafy (Cofidis) s.t. 12. Allan Davis (Liberty Seguros) s.t. 13. Luciano Pagliarini (Liquigas) s.t. 14. Robert Forster (Gerolsteiner) s.t. 15. Jean-Patrick Nazon (Ag2R) s.t. 16. Philippe Gilbert (FDJ) s.t. 17. Laurent Brochard (Bouygues Telecom) s.t. 18. Mauro Geros (Liquigas) s.t. 19. Danial Becke (Illes Balears) s.t. 20. Gerben Lowik (Rabobank) s.t. 1. Lance Armstrong (Discovery) 23hr 1min 56sec. 47.368 km/hr average speed over the 1,091 km race so far. The Finish: It was a long straight drag race. The full sprint started late. Boonen kept moving up but was still too far back. McEwen and Magnus Backstedt duked it out and McEwen got the win. 2 km to go: FDJ is lining up at the front for McGee. Boonen looks to be a way back. 5 Km to go: It's not raining. The crowds are huge. Davitamon is pounding hard at the front. There's lots of bumping as riders are trying to move up. Km 217, 11 to go: It's still all together with no attacks that I have seen. It's raining again. Vinokourov has moved up to the front, near Armstrong. Discovery is sitting well up front right behind the sprinter's pacemakers. Km 210: Credit Agricole, Quick Step and Davitamon are keeping the pace high to discourage breakaways. It's still not raining. Km 205: Wegmann sits up. He's caught. The pack is all together. Km 202: The crash victims are all back in the field. T-Mobile's mountain domestique Giuseppe Guerini flatted and got a super-fast wheel change. He should get on. Wegmann has less than 30 seconds and they've pulled the follow vehicles out from behind him. The peloton can see him now. Km 200: The gap is down to about 1 minute. Km 197: There was a crash in the middle of the peloton as they crossed an oblique set of railway tracks that were probably a bit wet and slippery. It looks like almost everyone is back up and chasing. Wegmann takes the final intermediate sprint. Then, a minute and a half later Boonen easily takes second place as Hushovd can't even move off his wheel. Km 191: It's down to 2min 14sec. The crowds lining the streets are really big. No German has won a Tour de France stage that ended on German soil. I don't think Wegmann will change this record. About 5 km to the third intermediate sprint. Km 186: Wegmann made it alone into Germany. Her still has 2 min 45sec. They sky over the peloton is black with heavy clouds. The streets are dry right now. At the front of the peloton are Quick Step and Domina Vacanze. Km 169: Wegmann's time alone seems to be coming to an end. The gap is now 3min 30sec. He may make to the German border. Quick Step has moved up to the front and is helping with the chase. Domina has also sent a rider to help. Km 156: Davitamon is stringing out the peloton. The lead is now 5 minutes. Km 151: Oh yeah. The second intermediate sprint. Credit Agricole and Quick Step set up parallel lead-out trains that then came together. Tom Boonen and Thor Hushovd went for it. When Boonen jumped Hushovd saw he would be beat and sat down. Boonen got second place (Wegmann, off the front won it, of course) easily. The rain has stopped agin. With the increased speed Wegmann's lead fell to 6 minutes. Davitamon has moved to the front of the peloton now. Km 147: Wegmann still has 8 minutes. Credit Agricole has sent Christophe Moreau to the front to help with the chasing. They would like to see their Thor Hushovd win today. Km 130: Christophe Mengin has made it back to the pack. Discovery is doing the work of pulling the field. The sprinter's teams don't seem to be in evidence at the front. Km 125: After a series of attacks, Fabian Wegmann (Gerolsteiner) went away on the first climb (Km 45) and is still away. At one point he had 8min 35sec. It's down to 8 minutes now. It's been raining off and on. It's raining now. With the finish in Germany, he's hoping to be a German winner finishing in a German town. Everyone who finished yesterday started today (187 riders,), no overnight abandons but during the stage Phonak's Steve Zampieri quit. Yesterday's tragic hero, Christophe Mengin who crashed on a slick corner just before the finish while leading was dropped very early by the pack. Both of the rated climbs have been completed. Gerolsteiner's Fabian Wegmann is now the mountain's competition leader. 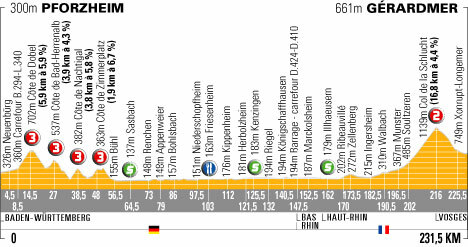 Stage 8, Saturday, July 9: Pforzheim - Gérardmer, 231.5 km. Into the Vosges mountains and the Tour's first second category climb. We should see some changes to the GC. Weather: 19C (66F), dry roads and sunshine. There is a chance of rain later in the stage. Above, Weening wins by in infinitesimal margin. Is this what lawyers call a distinction without a difference? Below: Alejandro Valverde, with Ullrich on his left, wins the field sprint for 3rd. Sirotti photographs. Results: Interesting post-race comments by Armstrong. He was left isolated on the climb. He said he didn't feel that good. He says there will be a talk about this at dinner. I'll bet. He said that Discovery decided to let Kloden go and that the dangermen are Vinkourov and Ullrich. David Zabriskie was able to escape elimination by beating the cutoff time by 1 minute. He came in 51 minutes after Weening. Here's what the Tour organization had to say about the finish: "The official timing system has sensors on every bike in the race. 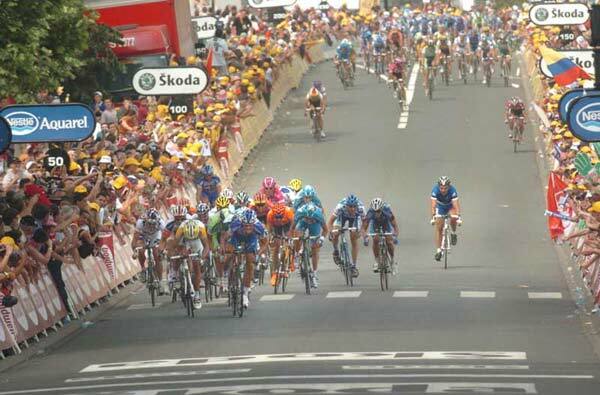 The finish of today's stage was so close that a photo had to be used to determine the winner. It's difficult to tell if Pieter Weening's tyre was ahead of Andreas Kloden's but the timing system declared the Rabobank rider the winner. The winning time was just 0.0002 of a second!" 1. Pieter Weening (Rabobank) 5hr 3min 54sec. 47.705 km/hr average speed. 2. Andreas Kloden (T-Mobile) s.t. 4. Kim Kirchen (Fassa Bortolo) s.t. 5. Jens Voigt (CSC) s.t. 6. Jan Ullrich (T-Mobile) s.t. 7. Cadel Evans (Davitamon-Lotto) s.t. 8. Christophe Moreau (Credit Agricole) s.t. 9. Chris Horner (Saunier Duval) s.t. 10. Alexandre Vinokourov (T-Mobile) s.t. 11. Stefano Garzelli (Liquigas) s.t. 12. Franco Pellizotti (Liquigas) s.t. 13. Oscar Pereiro (Phonak) s.t. 14. Jorg Jaksche (Liberty Seguros) s.t. 15. Dario Frigo (Fassa Bortolo) s.t. 16. 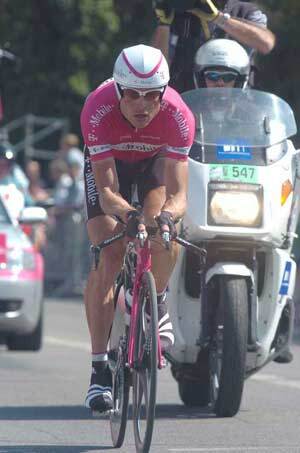 Evgeni Petrov (Lampre) s.t. 17. Levi Leipheimer (Gerolsteiner) s.t. 18. Michael Boogerd (Rabobank) s.t. 19. Michael Rogers (Quick Step) s.t. 20. Lance Armstrong (Discovery) s.t. 1. Lance Armstrong (Discovery)28hr 6min 17sec. 47.056 km/hr average speed over 1322.5 km. The Finish. Kloden led it out and Weening came of his wheel for a close photo finish win. Kloden gets second for the stage. A few seconds later Vinourov tried for the third place time bonification but Valverde got the field sprint. Riders are coming in to the finish area in small groups. That 2nd category climb really took its toll. 1 km to go: No orgainzed chase. Kloden is doing all the work, working for time. 5 km to go: 8 seconds. Kloden is working hard. CSC's Jens Voigt takes a pull at the front of the chase group. Now the gap is over 20 seconds. Km 220: Kloden is taking big chances on the descent. Weening has to sprint to get up to his wheel after some corners. The pack can see Kloden and Weening. It's about 10 seconds. Riders are getting up to the Armstrong group. It might be 40 riders now. Km 216: Kloden passes Weening meters before the summit with about 15 seconds lead on Armstrong's group. Weening and Kloden should get caught in a short time. Not many Discovery riders made the cut. Julich and Basso and Evans are there. Km 214: Kloden is just riding away. Armstrong is not marking him. T-Mobile isn't just sitting in this stage, letting Armstrong's team dictate the pace. Km 211: Vinkourov tests. Savoldelli brings Armstrong up to Vino. Vino goes again, joining an attack of Moreau. 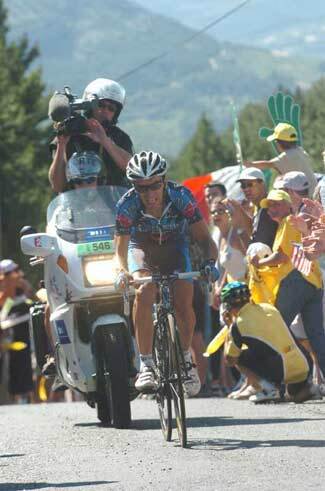 Armstrong joins him with Ullrich on his wheel. Alejandro Valverde goes. Vino goes again with Armstong and the others with him. Now Kloden (T-Mobile) goes. Basso goes after him. There are about a dozen riders in the Armstrong group. Km 209: The peloton is down to 40 riders. Illes Balears is still at the front of the pack with Discovery right behind. Weening has 22 seconds on the chasing trio lead by Flecha. It's still a little less than 2 minutes back to the field. It's a hairy descent to the finish. Weening may make this stick. Km 208: The break blew apart as soon as the climb got steep. Pieter Weening is away alone. He looks good. The peloton is shattering. O'Grady is off. Illes Balears is pounding away at the front. Flecha, Sorensen and Commesso are about 25 seconds behind Weening. The pack is a couple of minutes behind Weening. Km 201: The gap is down to 3 min. Illes Balears is doing the pacemaking at the front of the peloton, taking over from Liquigas. Both the break riders and the peloton riders are still in the big rings. It is a shame that OLN has given itself over to more and more "up close and personal" stories, constantly interrupting the race coverage. We get a few seconds of live race coverage and then, damn! A story on Vinokourov. You know guys, we really do like bicycle racing. You don't have to be afraid of showing the race. That's why we turned on your station. Km 189: The gap is down to 3min 50sec. The break is clearly climbing, but they are still in the big rings.Some riders in the peloton are on the levers, honking out of the saddle as the gradient starts to bite a little. Average speed for the first 3 hours is 47.1 km/hr. Km 181: We're near the base of the final climb. The gap is down to 4min 30sec. CSC's Dave Zabriskie did not get back on the field. He is almost 30 minutes back. Illes Balears riders are at the front of the peloton with Liquigas and Bouygues Telecom behind them. The riders in the break look intense and serious and appear to be really forcing the pace even if the peloton is slowly closing in on them. Km 170: Liquigas has gone to the front and is having an effect. The gap has fallen to 5min 40sec. Km 162: The gap has ballooned to 6 minutes. Discovery is leading the pack. Km 154: The riders in the break are doing short pulls in a rotating circle. I couldn't see if Commesso was taking his turn. Sorensen is the best placed rider in the break, being 2min 1sec behind Armstong in the General Classification. The gap is now 4min 11sec. Sorensen is the virtual Yellow Jersey. Boonen's group of chasing sprints has finally made it back to the peloton. Km 145: This race is pure aggression: 6 riders have bridged up to Sorensen. They have a gap of 2min 20sec on the peloton. The riders off the front are: Nicki Sorensen (CSC), Juan Antonio Flecha (Fassa Bortolo), Salvatore Commesso (Lampre), Cedric Vasseur (Cofodis), Pieter Weening (Rabobank), Ronny Scholz (Gerolsteiner) and Nicolas Jalabert (Phonak). Km 131: Cesar, Hushovd and Cancellara have been caught by the peloton. Sorensen, who attacked his companions, is continuing and has a gap of 40 seconds on the peloton. It's raining hard at the finish line. Before being caught, Hushovd won the second intermediate sprint. Km 118: The pack has increased the pace of the chase after going through the feed zone. The 4 riders have a lead of 55 seconds as the race covers the flat roads before the final Col de la Schlucht climb. Davitamon-Lotto is keeping the pace high taking advantage of Boonen's (Quick Step) being dropped. Davitamon's sprinter Robbie McEwen is in the main peloton, which is about 130 riders strong. Boonen's group is working hard. They are now within 1min 30sec of the peloton. Km 107: There is thunder over the finish city of Gérardmer. Sandy Cesar (FDJ) went away in one of the first breaks at about Km 14. When his companions gave up, he kept pressing on he was joined by others. Now Fabian Cancellara (Fassa Bortolo), Nicki Sorensen (CSC) and finally Thor Hushovd (Credit Agricole) are together with Cesar and have a gap of 2min 24sec on the main peloton. The pack broke up on the series of 4 category three climbs early in the stage. The chasing group has the tired Fabian Wegmann, and sprinters Boonen and Cooke. They follow the pack at 4 minutes. The stage was aggressive from the start. Breaks went off and were caught, including one with George Hincapie, Jens Voigt and Michael Rasmussen. By taking the early climbs, Rasmussen should be in Polka Dots this evening. More riders abandoned , Alessandro Spezialetti (Lampre), Christophe Mengin (FDJ, who crashed near the end of stage 6) and Serhiy Honchar (Domina Vacanze). That made 183 riders at the start. Sylvain Calzati (Ag2R) quit early in the stage. He has crashed several times this Tour. Isaac Galavez (Illes Balears) is also out. Liberty Seguros sprinter Allan Davis was relegated yesterday for not holding his line in the sprint. He caused the crash the resulted in Galvez's withdrawl from the Tour. 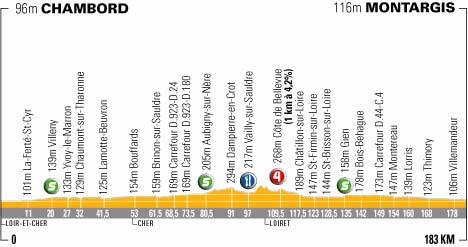 Stage 9, Sunday, July 10: Gérardmer - Mulhouse, 171 km. Le Ballon d'Alsace is not only the first time this year's Tour includes a 1st category climb. This climb was used as the first major ascent in Tour history. From my history of the Tour de France: "The 1905 Tour is notable for one big change. One of Desgrange's staffers, Alphonse Steinès, had a vision of how to transform the Tour and make the accomplishment of finishing the Tour even more heroic. He wanted to include mountains. At Steinès' urging, Desgrange had the Tour take a trip through the Vosges mountains in Eastern France with the Ballon d'Alsace and the Col Bayard climbs. Desgrange was terribly afraid of a failure. He reluctantly buckled under Steinès' advocacy, telling him if it the racers could not get over the mountains, the blame would be his." It wasn't until 1910 that Steinès was able to get Desgrange to include the high Pyrenees in the Tour. Km 115: Le Ballon d'Alsace (1,171m), 9.1 km, 6.8% gradient, 1st category. Weather: 19C (66F). Blue skies with some clouds. Small chance of rain. Above: Rasmussen finsihes his super ride and take the stage win. Below. Moreau gets an uncontested second as Voigt is sure he will spend the night and the next two days in Yellow. Sirotti photographs. 1. Michael Rasmussen (Rabobank) 4hr 8min 20sec. 41.315 km/hr average speed. 6. Anthony Geslin (Bouygues Telecom) s.t. 10. Gerrit Glomser (Lampre) s.t. 12. Oscar Pereiro (Phonak) s.t. 13. Chris Horner (Saunier Duval) s.t. 14. Christophe Brandt (Davitamon-Lotto) s.t. 15. Bert Grabsch (Phonak) s.t. 16. Kurt-Asle Arvesen (CSC) s.t. 17. Dario Frigo (Fassa Bortolo) s.t. 18. George Hincapie (Discovery) s.t. 19. Eddy Mazzoleni (Lampre) s.t. 20. Nicolas Portal (Ag2R) s.t. 12. Floyd Landis (Phonak) s.t. 21. Roberto Heras (Liberty Seguros) s.t. The Finish: Rasmussen kept driving his bike without slowing for a brilliant win. He was away for 167 kilometers, almost the entire stage. The huge crowds are ecstatic. Voigt and Moreau kept pushing hard without any sprinter's games. Voigt let Moreau have the second place as Moreau took a monster pull at the end. Stuart O'Grady started his sprint for 4th pace way back and made it stick. 5 km to go: Rasmussen is clearly headed to a stage win. That will give Rabobank back to back Tour stages victories. Km 156, passing under the 15 km to go banner: Rasmussen is not slowing. He still has 4min 5sec on Voigt and Moreau and 8min 5sec on the peloton. Voight punctured, but he's back with Moreau. Riders who came off the pack on the Ballon are making their way back on. Thomas Voeckler (Bouygues Telecom), smiling, just got on. Km 146, 25 to go: Rasmussen is on fire. He's keeping Moreau and Voigt, both powerful riders, at 4 minutes. He should make to the finish for the win. The peloton is still back at 8 min 43 sec. Still led by Discovery. Km 135: Rasmussen still has 4min 5sec on Voigt and Moreau. The pack is still 9min 5sec back. Rasmussen is 7min 5sec behind Armstrong in GC. Discovery is clearly happy to let the men off the front get away. 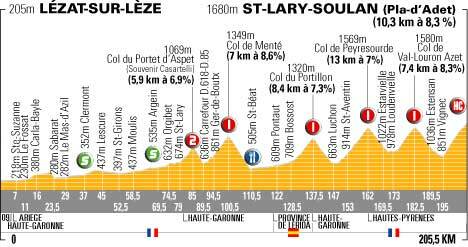 None are real threats for the win and Discovery saves energy with the real climbing starting Tuesday with the category 1 hill-top finish at Courchevel. Km 123: Rasmussen is flying down the hill. Discovery led the 60-man peloton over the top of the Ballon d'Alsace at a moderate pace, 9 min 30 sec behind Rasmussen. Km 115: Rasmussen goes over the top alone. He has taken the first place points for every one of the day's climbs. Moreau and Voigt are chasing hard. Moreau wants the climbing points, Voigt wants the GC time. The peloton, led by a fast moving Discovery team, has spit out a lot of riders. Pereiro looks to have been caught. Km 112: Rasmussen is still gone. The first chase group has broken up and is now down to 3 riders: Moreau, Voigt and Vicioso. Oops, Visioso, who is a sprinter, is now off. Discovery is now using Rubiera and Beltran to pull the peloton. In the peloton the first attack has gone off. Phonak's Oscar Pereiro is testing Discovery's resolve. Km 107: Rasmussen is alone on the lower slopes of the Balloon d'Alsace. Chase Group 1 is 1min 45sec back. Cioni is still between them. The peloton is now over 9 minutes back. Km 93: Rasmussen and Cioni are on the Col de Bussang. Rasmussen is nursing Cioni who keeps coming off every time the gradient bites. On the flats Cioni has been doing his share. OK, Rasmussen has given up on Cioni and has taken off on his own. Commesso made it back to the peloton and is getting attention from the race doctor. Gomez has been taken away in an ambulance. The first chase group is still back at 2min 20sec. The peloton is a little over 8 minutes back. The average speed for the first two hours is 40.5 km/hr. Km 73: Chase group 1 is 2min 20sec behind as they go over the top. The peloton is over 8 minutes back. Discovery may be thinking of giving the jersey to Voigt, the virtual Yellow Jersey, who isn't a threat to the final General Classification. Voigt is currently the second place GC man, 1 minute behind Armstrong. Leading: Polka Dot Jersey Michael Rasmussen (Rabobank) and Dario David Cioni (Liquigas). Rasmussen has to ease his efforts a bit to allow Cioni to stay with him. At 2min 43 sec: Chase group 1: Christophe Moreau (Credit Agricole), Zabier Zandio (Illes Balears), Angel Vicioso (Liberty Seguros), Alexandre Moos (Phonak), Inigo Landaluze (Euskaltel) and Jens Voigt (CSC). Vicioso is having trouble staying with this group. At over 7 minutes: The peloton led by what looks like a complete Discovery team. T-Mobile is right behind them. The first hour was raced at 41.4 km/hr. Rasmussen (Rabobank) took off for the points of the Grosse Pierre, the first climb. Dario Cioni (Liquigas) took off after him and hooked up. Ullrich crashed on the descent near the summit but got back on. David Zabriskie, suffering from his crash, came off almost instantly and has now abandoned. Igor Gonzalez de Galdeano, who crashed at Km 3 also abandoned. On the Feignes, the second climb, a group of seven riders including Christophe Moreau got away. Big Jaan Kirsipuu abandoned on the Grand Ballon. The Tour has a projected schedule for each day. 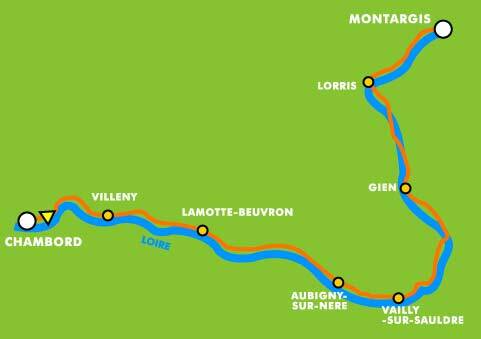 At the fastest projected speed for the day, 42 km/hr, the race should crest the Grand Ballon at 2 PM local time (5:00 AM PDT). 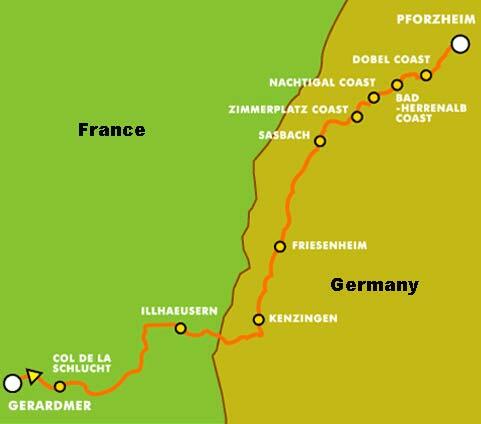 The Ballon d'Alsace should be crested at 3:14 PM (6:14 AM PDT). Monday, July 11: Rest day in Grenoble after the transfer from Mulhouse. 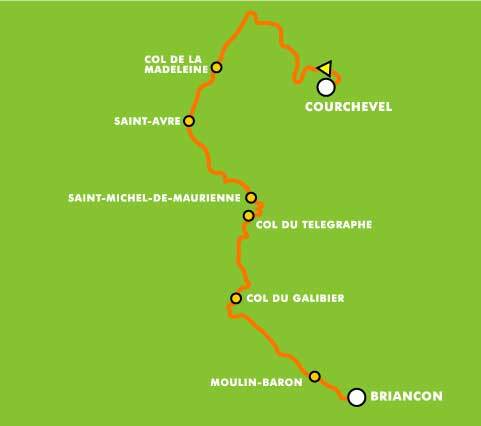 The high Alpine stages start Tuesday with the category 1 climb (22 kilometers of 6.2%) to the hilltop finish at Courchevel. 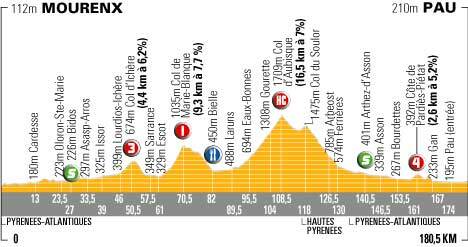 Stage 10, Tuesday, July 12: Grenoble - Courchevel (hilltop finish), 181 km (shortened due to a farmers' strike). The Tour starts here. We'll get one of two important questions answered. Who has the suds to climb the big stuff? There will be no sitting on. Months of speculation will be largely answered in the final 20 kilometers of this stage. The other question, who can take this infernal pace of this Tour for three weeks without cracking, will go unanswered for a while. Will some of the GC contenders start to break down? We won't get that answer until the Pyrenees. Weather: 22C (71F) at the start in Grenoble. There is a very slight chance of rain. Results: So, T-Mobile with a budget of $23.3 million and some of the most talented riders on the planet could barely put 1 rider in the top ten of the first Alpine stage. Has any team ever done less with so much? For comparison's sake, Discovery's budget is $15 million and Illes Balears is $8.4 million. 1. Alejandro Valverde (Illes Balears) 4hr 50min 35sec. 36.65 km/hr average speed. 2. Lance Armstrong (Discovery) s.t. 9. Andreas Kloden (T-Mobile) s.t. 10. Andrey Kashechkin (Credit Agricole) s.t. 11. Floyd Landis (Phonak) s.t. 12. Leonardo Piepoli (Saunier Duval) s.t. 13. Jan Ullrich (T-Mobile) s.t. 19. Yaroslav Popovych (Discovery) s.t. 20. Chris Horner (Saunier Duval) s.t. 1. Lance Armstrong (Discovery) 37hr 11min 4sec. Average speed of 44.934 km/hr over the race's 1,686.0 km so far. 16. Alexandre Vinokourov (T-Mobile) s.t. 18. Carlos Sastre (CSC) s.t. 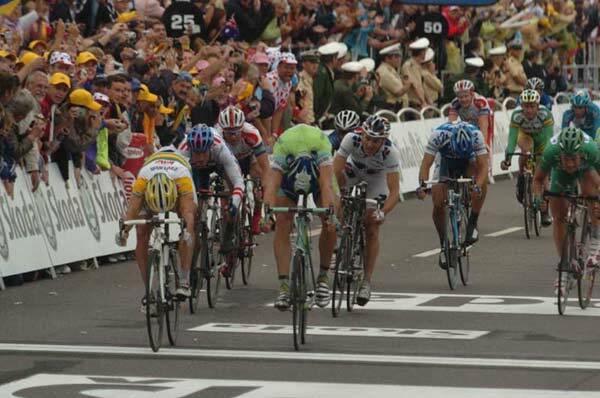 The finish: Now Armstrong goes with Valverde on his wheel. They are clear away from the other two. Alejandro Valverde, the better sprinter, takes the stage with Armstrong right with him. Looks like Rasmussen beat Mancebo. Basso looks like he's coming in about 1 minute after Valverde. Now Leipheimer rolls in 1min 14sec after Valverde. Julich and Vinokourov came in over five minutes later. 1 km to go: The riders seem to be positioning themselves for the sprint. Valverde is leading. Rasmussen goes! They're on him. Back together. 2 km to go: The 4 are still together. When the pace slows Armstrong comes to the front and drives it faster. Landis is 1min 35sec back. 5 km to go: Mancebo is doing the work. Armstrong and Rasmussen look good as does Valverde. Who wold have thought that T-Mobile would be tossed and gored so early in the Tour. Landis is 1min 15sec back. Kloden seems to be doing all the work of dragging Ullrich and limiting their losses. Rasmussen not only has a polka-Dot jersey, he's got dotted shorts. Km 186: It's Armstrong, Mancebo, Rasmussen and Valverde. Basso is at least 15 seconds back. 1min 15sec back to Ullrich who is riding with Kloden. The climb still gets steeper up the road! Km 183: It's Armstrong, Mancebo, Rasmussen, Basso, Valverde. Armstrong is doing most of the work. Rasmussen is now doing the pacemaking and looks good. Basso looks stressed. Armstrong will probably test him pretty soon. There it is. Basso and Mancebo are off. Mancebo is back on. Km 181: Ullrich is off. Basso is with Armstrong and looking good. Landis is off. Mancebo is still there. So is Rasmussen and Valverde. Kloden cracked. T-Mobile has fallen apart. Jaksche is caught. No one is off the front any more. Leipheimer has crawled back on. Cadel Evans just came off. Km 179: Vinokourov has moved to the back of the group. Hincapie has swung off and let himself get dropped. Now Popovych is leading with Armstrong on his wheel. Vinokourov is gapped! Polka Dot jersey is still threre. Popovych went back to talk to Armstrong. A few words pass. Popovych drops the hammer. And now Armstrong takes over and crushes the group. Km 178: It's a small group with Leipheimer, Basso, Vinokourov, Armstrong, Ullrich, Landis. Popovych, Hincapie and Kloden are also still there. Km 175: Jaksche dropped Pereiro and is away alone with 16 km to to go the summit. The still-Discovery-led peloton has swept up Krivtsov. Rabobank's Menchov, a good climber is off! Beloki is gone. 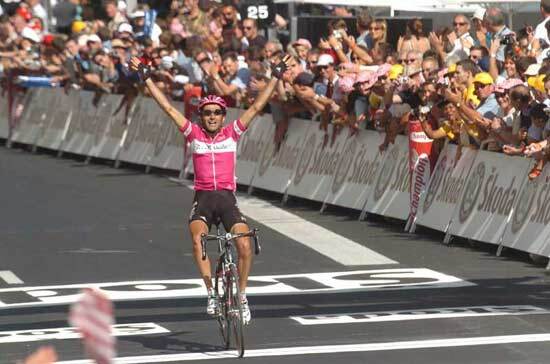 So is 2000 Giro winner Garzelli. Vladimir Karpets, the White Jersey is gone. Botero, Julich are off. CSC's Carlos Sastre takes off. He's not getting much of a gap as Discovery keeps the pace red-hot. He's caught. Brochard is caught by the peloton. Km 171: We're on the climb. The break is down to 4 riders: Jaksche, Brochard, Pereiro and Krivtsov. The peloton has started spitting out riders. Discovery is still doing all the work. Vinokourov, Ullrich and Basso are sitting right behind them. Ag2R's Krivtsov flats. Now Brochard is off the break. In front now it's Pereiro and Jaksche. Voigt and Mayo have been dropped by the peloton. Km 165: The break is 6 km from the beginning of the climb. Discovery is still hammering hard with what looks like all 9 members of the team at the front. They've brought the gap down to 3min 15sec. In the break, Jaksche has been missing his pulls. Sanchez took a hard pull and swung off the break. Is Jaksche waiting for Heras to come up? Pereiro is still doing a lot of work in the break. Now the gap is under 3 minutes as the road starts to rise. Km 156: Discovery is worried about Pereiro, who is a good rider and can't be given too much of a lead. He's about 5min 20sec behind Voigt in the GC. The gap is down to 3min 42sec. Discovery is really stepping on the gas. No other team is helping. The pack is still almost a complete single file. 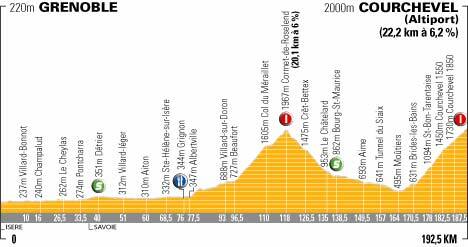 It will be interesting to see if the Discovery riders have the energy to climb hard after this energetic pacemaking. If so, then they are a truly magnificent group of riders. Pereiro and Jaksche are doing the work in the break. Km 151: Sanchez has been told to stop working with Brochard until his Liberty Seguros teammate Jaksche makes it up to them. Discovery is taking hard pulls, stringing the pack out. The pack is about 4 minutes back. Is Armstrong trying to bring the race together for a stage win? He must feel good. OK, Jaksche, Pereiro and the others have made it up to Brochard and Sanchez. That makes nine riders off the front. 10km to go to the final climb. Km 140: Brochard flew down the mountain but has been caught by Luis Sanchez. Followed at 30 seconds are Bortolami, Facci, Krivtsov and Posthuma. Then Pereiro and Jaksche who have caught Inaki Isasi are at 2min 40sec. Then the peloton about 6 minutes behind Brochard. Discovery's Popovych crashed on the descent but he's back up and in the peloton. Discovery is massed at the front of the peloton. Heavy clouds are forming over the final mountain. It's starting to get windy at the finish line. The dropped riders are chasing and getting back on the peloton. The peloton has grown from about 45 to over 60 riders. Km 118: Brochard led the break over the crest of the Roselend. Jaksche (Liberty Seguros) and Pereiro (Phonak) jumped from the peloton a couple of kilometers from the crest with Jaksche getting the 8th place climber's points. Jaksche was 3min 40sec behind Brochard. Now the riders are flying down the hill. Brochard isn't waitng for his breakaway companions, being about 12 seconds ahead. Km 114: The five riders in the break look very grim, looking very much like they are doing the hard work that doing a category 1 climb is. Discovery has three riders at the front now: Rubiera, Beltran and Noval. Discovery's big boys Padrnos and Hincapie are still in the reduced peloton of about 45 riders. The gap to the break is now under 5 minutes.Voigt is on the edge of losing contact with the peloton. Nope, he's off. What a shame. There are three kilometers to go so he will probably regain contact on the descent. All the big GC guns are still there. The peloton slows a little and Voigt does a superhuman effort and regains contact. Bravo! Km 111: The attacks in the peloton have started. Garzelli gave it a try. He was brought back. Iban Mayo has been dropped. The peloton is shattering and scattering riders all over the mountain. The gap is 5min 30sec as the peloton rides a fast tempo. The front break is down to five: Posthuma, Facci, Brochard, Sanchez and Krivtsov. Discovery (Beltran) and T-Mobile are keeping things moving at the front of the peloton. Phonak's Floyd Landis is close by. Voigt is no longer at the front. Km 107: Saunier Duval is at the front of the peloton. Jens Voigt is leading the peloton now. The gap is down to 6min 21sec as the race is part way up the Roselend. The sprinters are getting tossed out the back of the peloton as the climb starts to bite. 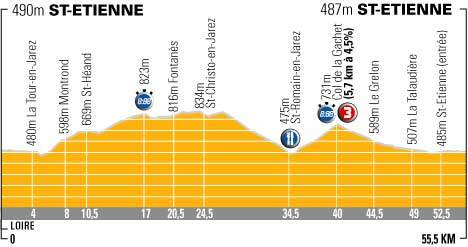 Km 96: Getting close to the first climb, the Cormet de Roselend, the gap is down to 8min 40sec. Km 76: Almost from the gun a series of breaks went. By the 16th kilometer a group of seven had come together: Laurent Brochard (Bouygues Telecom), Yuriy Krivtsov (Ag2R), Joost Posthuma (Rabobank), Inaki Isasi (Euskaltel), Gianluca Bortolami (Lampre), Luis Sanchez (Liberty Seguros) and Mauro Facci (Fassa Bortolo). Laurent Brochard is the highest ranked GC rider in the group at 7min 58sec behind Yellow Jersey Jens Voigt. At one point the break was 10min 40sec ahead of the peloton. At the feed zone (Km 76) the lead was down to 9min 10sec. Credit Agricole has four men at the front of the peloton doing the chasing. Lampre lost another rider: Gerrit Glomser abandoned at the feed zone. That leaves 173 riders in the Tour. 8 teams still have complete rosters: Discovery, T-Mobile, Rabobank, Cofidis, Quickstep, Bouyges Telecom, Gerolsteiner and Euskaltel. The start: 174 riders are left in the Tour. Discovery, Ag2R, CSC and Lampre riders were given blood tests and all passed but 1. Evgeni Petrov's (Lampre) hematocrit was too high and he was not allowed to start. The neutral portion of the start was extended a bit because of farmer's protests at the start. The stage is therefore shorted by 11.5 km. Km 133: Col du Galibier (2,645 m), 17.5 km, 6.9% gradient. Hors Category. Weather: 24C (75F), clear. Looks like a nice day for a bike race. 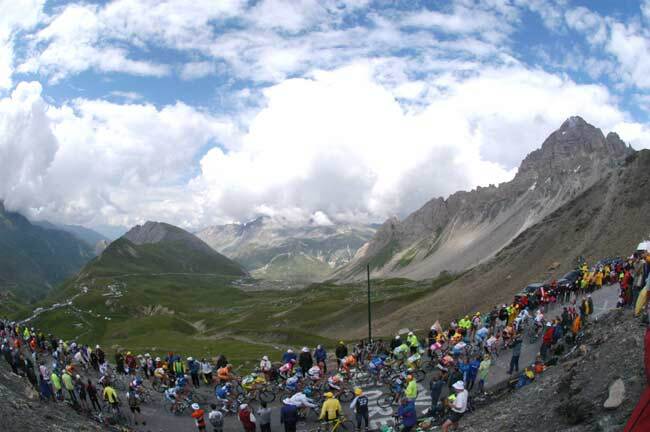 It's a beautiful day in the Alps as the riders climb the Galibier. 1. Alexandre Vinokourov (T-Mobile) 4hr 47min 38sec. 36.087 km/hr average speed. 2. Santiago Botero (Phonak) s.t. 4. Bobby Julich (CSC) s.t. 5. Eddy Mazzoleni (Lampre) s.t. 6. Lance Armstrong (Discovery) s.t. 8. Levi Leipheimer (Gerolsteiner) s.t. 10. Georg Totschnig (Gerolsteiner) s.t. 11. Alejandro Valverde (Illes Balears) s.t. 12. Yarosalv Popovych (Discovery) s.t. 13. Ivan Basso (CSC) s.t. 14. Michael Rogers (Quick Step) s.t. 15. Jan Ullrich (T-Mobile) s.t. 16. Francisco Mancebo (Illes Balears) s.t. 17. Jorge Jaksche (Liberty sEguros) s.t. 18. Andrey Kashechkin (Credit Agricole) s.t. 19. Floyd Landis (Phonak) s.t. 20. Andreas Kloden (T-Mobile) s.t. 1. Lance Armstrong (Discovery) 41hr 59min 57sec. 43.902 km/hr average speed over the 1,859 kms covered so far. The Finish: Botero led it out. Then side by side. Vinokourov gets clear and gets a clean win. Discovery led the charge into town. Moreau won the field sprint, coming in 1min 15sec after Vino. Armstrong first tried to sprint and then sat up. Armstrong stays safely in Yellow. 3 km to go. No sprinter's games. Botero and Vinokouorv are taking short, hard pulls. The pack is 1min 30sec back. 8 km to go: 1min 52sec. 16 km to go: The gap is 2min 16sec. The peloton is moving fast and eating away at the lead. Discovery's Savoldelli is taking a big, hard pull at the front of the peloton. Vinokourov's transponder came loose and a mechanic came up and cut it off on the fly, leaning out of his car. Botero and Vinokourov are working well together, trading pace. Both are very strong on the flats. Botero is a former world time trial champion. 25 km to go: Botero and Vinokourov have 2min 30sec. Km 141: Botero has hooked up with Vinokourov. Botero is taking the lead to keep the descent moving fast. Km 133: Botero follows Vinokourov at 42sec. Rasmussen detaches himself from the Armstrong group and is away. He goes over 3rd, 2min 24sec behind Vinokourov and 18sec ahead of the Discovery led pack. Will Rasmussen try to stay away to the end or was he just going for the climber's points? He waited and is with the Peloton. Botero, a good descender, should catch Vinokourov. Vinokourov still has 2min 40sec on the peloton. 1 km to the summit: Vino has 2min 49sec. When he goes over the top, he'll have 40 km of descent to the finish. He's still riding very well. Vinkourov is 6min 32 sec behind Armstrong in the General Classification. Discovery is still riding tempo at the front, not panicking, saving their strength. Armstrong will have lots of help on the descent and chase to the finish. 5 km to the summit: Vinokourov's shoulders are rocking as he rides in the saddle. He's got 2min 59 sec. Hincapie is leading the pack.T-Mobile's Andreas Kloden, riding in the back of the now small peloton, looks like he's about to come off. 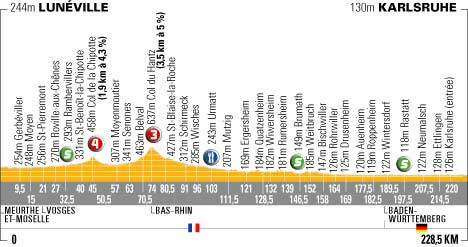 Basso, Ullrich, Leiphemer, Landis, Rasmussen and Evans are still in the Armstrong group. Discovery isn't throwing any high heat yet. Km 126: Vinokourov looks good, riding with a good cadence. He actually looks better than he did on the Madeleine. He's got 6 km to go to the summit. The lead is still 3min 15sec. Armstrong still has 4 teammates. Chris Horner (Saunier Duval) has come off. Pereiro has been caught by the pack and spit out the back. Botero is staying as close to Vinokourov as he can. He's about 35 seconds behind. Km 122: On the slopes of the mighty Galibier. Botero and Vinokourov have dropped Pereiro. Discovery is leading the peloton which is 3min 11sec back. Rasmussen is shadowing Armstrong. 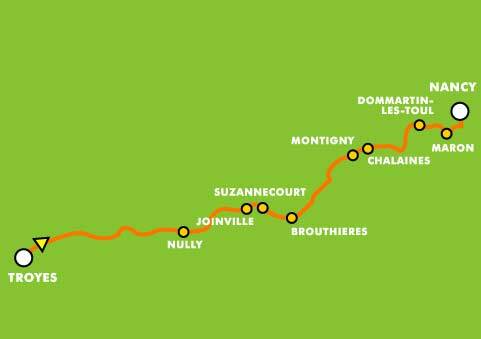 There is a special prize of $6,000 for the first over the highest climb of the Tour. This year it is the Galibier. The prize is named after the father of the Tour de France, Henri Desgrange. Now Vinokourov has dropped Botero. He's going up the Galibier alone. He can look down the mountain and see the peloton on the switchbacks below. Km 113: Over the Telegraphe. Botero went first followed by Vinokourov and then Periero. The Discovery-led pack followed at 3 minutes. Km 103: The pair in the lead are looking like they have been away all day. They are moving well, but they don't look very fresh. Discovery is all massed at the front of the peloton with Valverde and the T-Mobile riders right behind. You know, the usual. Botero made it back up to Vinokourov and Pereiro. Km 100: Martinez was dropped by the break as soon as the Telegraphe started to bite. It's now Pereiro, Botero and Vinokourov. The gap is 2 minutes back to the Armstrong group. Now Botero has been dropped. He was in trouble on the Madeleine. Km 96: The gap has gown to 1min 53sec. The peloton has about 40 riders. That will change in a few kilometers as the mountain starts. Vinokourov won the intermediate sprint and took the 6 second bonification. Every little bit helps. Km 90: As the four breakaways approach the lower slopes of the Telegraphe their lead is 1min 37sec. Discovery isn't letting them get too far away. Km 77: After the descent. The riders are taking on food and the gap of the four to the field is 1min 20sec. Km 68: Pereiro has rejoined the break. So has Egoi Martinez (Euskaltel). They are a group of four with a 55 second lead on the Armstrong group. Vinokourov lets the others descend a few meters in front of him, allowing a small gap so that he can see his own line. The pack was down to 25 riders over the crest but dropped riders are regaining contact. Km 65: Oscar Pereiro overshot a corner during the descent and went off the road and into a meadow. Now it's Botero and Vinokourov. Pereiro is back on the road and chasing back to Vino and Botero. Km 57: After see-sawing off the leaders, Botero went over the Madeleine first with Vinokourov right on his wheel. Vinokourov kept forcing the pace, trying to keep his lead over the pack intact . The peloton went over 46 seconds later. Moreau beat Rasmussen for the 14 climber's points up for grabs. Rasmussen let him have it given that he has a 70 point lead in the climber's competition. Now they're hauling down the big mountain. Km 52: The gap is only 28 seconds near the crest of the Madeleine. Discovery is still leading the pack. Rasmussen is staying right by Armstrong. It looks like the pack can see the break when the road straightens. The pack has now caught Hushovd. Heras was swept up by the field and then spit out. Strange for a 2-time Vuelta winner. The break has dropped Horner and Mancebo, and they have been caught by the pack. Km 44: On the Madeleine 10 riders went clear. It contains an interesting number of fancied riders who blew up yesterday as well as Mancebo who climbed with Armstrong: Alexandre Vinokourov (T-Mobile), Francisco Mancebo (Illes Balears), Egoi Martinez (Euskaltel), Oscar Sevilla (T-Mobile), Jose Luis Arrieta (Illes Balears), Santiago Botero (Phonak), Chris Horner (Saunier Duval), Roberto Heras (Liberty Seguros), Pietro Caucchioli (Credit Agricole) and Oscar Pereiro (Phonak). Heras was dropped from tis group. the gap back to the filed is about 1 minute. 172 riders started. Dario Frigo (Fassa Bortolo) is said to have been arrested because his wife was caught at a border control with EPO. The race began with a 19 km descent down from Courchevel. Tom Boonen, the leader in the points competition, crashed and had to chase for a long time before regaining the peloton. Thor Hushovd (Credit Agricole) and Samuel Dumoulin\(Ag2R) went clear on the descent. Hushovd, as the pair started the Madeleleine, dropped Dumoulin. At one point the pair were almost 7 minutes ahead of the peloton. Husahovd went on his own, probably looking for the points in the intermediate sprint which would give him the Green Jersey. 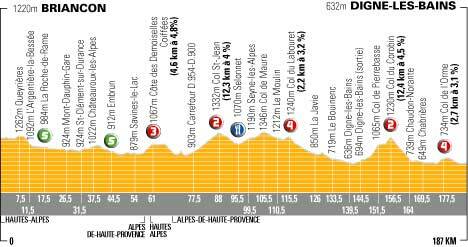 Stage 12, Thursday, July 14: Briançon - Digne les Bains, 187 km. Weather: 24C (75F) at the start, sunny and will get hotter during the day. Put another snail on the barbecue! David Moncoutie, a Frenchman riding for a French team wins the stage on Bastille Day. Sirotti photo. 1. David Moncoutie (Cofidis) 4hr 20min 6sec. 43.137 km/hr average speed. 4. Patrice Halgand (Credit Agricole) s.t. 5. Jose Luis Arrieta (Illes Balears) s.t. 7. Axel Merckx (Davitamon-Lotto) s.t. 8. Juan Garate (Saunier Duval) s.t. 10. Stuart O'Grady (Cofidis) s.t. 11. Massimo Guinti (Fassa Bortolo) s.t. 16. Janeck Tombak (Cofidis) s.t. 18. Fred Rodriguez (Davitamon-Lotto) s.t. 19. Yuriy Kirvtsov (Ag2R) s.t. 1. Lance Armstrong (Discovery) 46hr 30min 35sec. 43.664 km/hr average speed over the 2,046 kms covered so far. 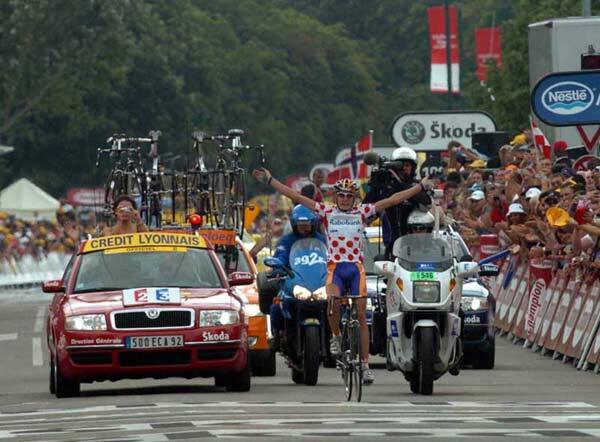 The finish: David Moncoutie (Cofidis) wins the Tour stage on Bastille Day. Can't get any better than that for a Frenchman. The huge crowds are ecstatic. Sandy Casar (FDJ) made it a French 1-2 by winning the sprint of the chasing breakers. Over three minutes later Thor Hushovd beat O'Grady for the minor placings. 10 minutes later after a leadout by Fred Rodriguez, Robbie McEwen won the field sprint. Those few remaining points could make a big difference in the final competition for the Green Jersey. 5 km to go. Still 30 seconds. Merckx is trying to get things organized for a good chase but can't get his breakaway companions to really get together and close the gap. Km 176, 11 to go, as the Col de L'Orme starts: Moncoutie has extended his lead to 35 seconds. The attacks have started in the break.There goes Vicioso. He's caught by the others. Km 168, 18 to go: Moncoutie still has 25 seconds with 18 km to go. He is being chased by Merckx, Vicioso, Pellizotti, Garate, Halgand, Arrieta and Casar. Km 155: Axel Merckx is doing the lion's share of the work chasing Moncoutie. Moncoutie has 40 sec. Pellizotti, feeling the effects of the long break has come off. The peloton is 6min 30sec back. Km 147: The break is on the 2nd category Col du Corobin. O'Grady did a little test acceleration. and was brought back. Now he dropped to the back and Thor Hushovd went back to keep an eye on him. Surely the climbers in the break will try to break loose from Lombardy, O'Grady and Hushovd who all have wonderful sprinting abilities. Pellizotti is a superb climber who would get crushed in a sprint with this crowd. There goes David Moncoutie (Cofidis). He has a good gap. He has 30 km to go. Big job. O'Grady and Hushovd have been dropped by the break. Now Lombardy is gone. Davitamon has given up the chase.Discovery is leading the pack and the gap has grown to 5min 16sec. Km 143: The race has gone through the finish town of Digne les Bains and have headed back out into the country again.The Davitamon 4 riders have either run out of gas since they have been chasing since km 95 or have just let up. The lead has grown to 4min 45sec. Km 137: The gap is still 4 minutes. Robbie McEwen is sitting in the middle of the Discovery crew who are right behind the 4 Davitamon workers chasing the break. The third hour covered 45.4 km. The average speed for the first three hours is 44.5 km/hr. Km 121: The gap is 4 min 10 sec. Stuart O'Grady is working very hard in the break. Km 114: Davitamon has 4 riders at the front of the peloton. I don't see how they can catch the thirteen riders taking short, hard pulls and who look reasonably well organized. The gap is still about 4 minutes. Km 106: Even though the break has Axel Merckx (Davitamon), Robbie McEwen has put the Davitamon-Lotto team at the front of the peloton to bring the break back. He now feels that he is competitive in the Green Jersey competition with Boonen's withdrawal. The pack is strung out. The gap had grown to five minutes and is now down to about 4 minutes. It was inevitable that with all the superb sprinters in the break that the attacks would start. On the Col de Labouret Sandy Casar (FDJ) has taken off and has a small gap on the break. Never mind, he's caught. Km 94: The gap to the break is now 3min 55sec. Discovery led the peloton over the crest of the Col Saint-Jean. The second hour of the race covered 37.3 km. That makes an average speed of 43.9 km/hr for the first two hours. None of the riders in the break are a threat to the General Classification. The highest placed rider in the break is Sandy Caser of FDJ. He is currently in 31st place at 17min 2sec. Km 79: There has been a series of attacks that were brought back. Then Saunier Duval's Juan Manuel Garate went. At km 68 10 other riders joined him. The break now has a lead of 2min 25sec. The riders in the break: Stephan Schreck (T-Mobile), Giovanni Lombardi (CSC), Jose Luis Arrieta (Illes Balears), Axel Merckx (Davitamon-Lotto), Massimo Giunti (Fassa Bortolo), Juan Manuel Garate (Saunier Duval), Angel Vicioso (Liberty Seguros), Patrice Halgand (Credit Agricole), Franco Pellizotti (Liquigas), David Moncoutie (Cofidis) and Sandy Casar (FDJ). then Stuart O'Grady (Cofidis) and Thor Hushovd (Credit Agricole) joined them. The peloton has been split in two on the Category 2 Col St. Jean. The first hour was pretty quick, 50.5 km/hr. Manuel Beltran (Discovery) crashed on the first climb. He had to abandon. There are now 162 riders left in the Tour. This is July 14, Bastille Day, the French national hoiday. Expect the French riders to try for glory. 14 Frenchmen have won stages on July 14 since the war. The latest was Richard Virenque in 2004. Tom Boonen, who crashed on the opening descent from Courchevel yesterday did not start today. Boonen was the wearer of the Green Jersey awarded the leading sprinter. Thor Hushovd (Credit Agricole) is now the leader of the points competition, although he is not wearing the Green Jersey today. Stuart O'Grady (Cofidis) is second in the points at 109 points and Robbie McEwen (Davitamon-Lotto) has 96. Former Yellow Jersey in this year's Tour, Jens Voigt, came in too late yesterday and missed the time cutoff. Feeling ill, he was eliminated from the Tour. 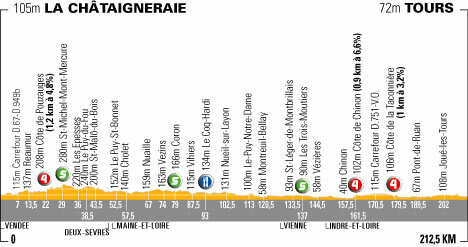 Stage 13, Friday, July 15: Miramas - Montpellier, 173.5 km. The Alps are finished. Saturday and Sunday in the Pyrenees will be unbelievably hard. Saturday will end with and HC climb followed by a category 1 hilltop finish. Sunday will have a category 2 climb followed by four cat 1's then an HC hill-top finish. Basso has been saying for months that this is where the Tour will be decided. I would guess Friday will be another day for an opportunist break while the big guns try to keep their jets cool. Weather in Montpellier: 26C (79F), Sunny, 63% humidity. Wind from the ESE at 21 km/hr (13 mph). The road is so hot today that the road surface has melted at the 80 km mark. They will hose down the road to cool it. Perfectly timed. McEwen wins that last likely bunch sprint before Paris. That should be his lead-out man, Fred Rodriguez, just under his right arm. Thor Hushovd is behind him on his left in green. Sirotti photo. 1. Robbie McEwen (Davitamon-Lotto) 3hr 43min 14sec. 46.632 km/hr average speed. 4. Guido Trenti (Quick Step) s.t. 7. Robert Forster (Gerolsteiner) s.t. 8. Magnus Backstedt (Liquigas) s.t. 9. Gianluca Bortolami (Lampre) s.t. 10. Chris Horner (Saunier Duval) s.t. 11. Allan Davis (Liberty Seguros) s.t. 12. Baden Cooke (FDJ) s.t. 13. Peter Wrolich (Gerolsteiner) s.t. 14. Rafael Nuritdinov (Domina Vacanze) s.t. 15. Luke Roberts (CSC) s.t. 16. Sylvain Chavanel (Cofidis) s.t. 17. Inaki Isasi (Euskaltel) s.t. 18. Lorenzo Bernucci (Fassa Bortolo) s.t. 19. Laurent Brochard (Bouygues Telecom) s.t. 20. Samuel Dumoulin (Ag2R) s.t. GC after stage 13. The riders fifth and lower moved up 1 place with the abandonment of Valverde. 1. Lance Armstrong (Discovery) 50hr 13min 50sec. 10. Floyd Landis (Phonak) s.t. 17. Carlos Sastre (CSC) s.t. The Finish: Horner stopped working and forced Chavanel to to all the last work and they were swept up in the final straight. McEwen took the stage win. 2 km to go: 12 seconds. 5 km to go: 16sec. Discovery is still at the front. The sprinter's teams still haven't come to the fornt in an organized way. 7.5 km to go: Horner tosses his bottle. He and Chavanel look good and are extending their gap. The remnants of the break have been caught. Now only the two are off the front. Now the peloton is accelerating and the gap is only 18sec. 11 km to go: Chavanel gets away, but Chris Horner isn't giving up. Awesome! He's on Chavanel's wheel and is now, of course, taking a pull. What a ride! They are 8 seconds ahead of the break and 18 seconds ahead of the peloton. Under the 15 km to go banner: The gap is 17sec. Discovery is massed at the front to control things and keep any opportunist threats to the GC from getting away. Cofidis' Sylvain Chavanel has taken a flyer. Chavanel has made it up to the break. He tried to go by but they got on his wheel. The guys in the break are looking edgy, wanting to attack. Km 153, 21 to go: The gap is 36 seconds. Bam! There goes Quick Step's Servais Knaven, a powerful, clever rider. He's got a real gap as he tries to bridge up to the break in the 175" gear. Since Boonen is out of the race, the Quick Step riders have been able to sit on rather than work to brng things together for a bunch sprint. No, they are not going to let a former Paris-Roubaix winner ride away. He's back in the pack. Da Cruz attacked the break but they brought him back. Km 141, 33 to go: The gap is 48 seconds. The peloton can see the break. After all that hard work, can Davitamon keep things together for 30 kilometers? The average speed of the third hour was 43.5km/hr making the average for the first three hours 46.5km/hr. OK, Davitamon has eased off and maintained the lead at a little under a minute. They are keeping the speed high enough to discourage break attempts but are leaving the tired break up the front. They don't want to catch the five up front too soon because then the attacks will surely start. Km 131: After being pegged at about two minutes for a while the lead dropped again, now 1min 30sec. Davitamon has five men at the front, including their protected GC man Cadel Evans. I haven't actually seen Evans taking pull. I can't believe they would start burning him up with what's facing the race tomorrow. Now the gap is 1min 21sec. Horner just took another big pull in the break. But the gap has fallen again, now it's 1min 15sec with 36 km to go. Km 120: The gang of five have had their lead cut to 2min 15sec. With 54 km to go, the break will very likely get caught. Km 102: The break is working hard. When it slows a bit they get out of the saddle and kick it up. The pack is working hard as well. Lampre and Davitamon are still eating into the gap. It's down to 3min 45sec. The second hour of today's stage covered 45.2 km. The average speed for the first two hours was 48.1 km/hr! That's 29.9 mph! I've been in races that fast and it hurt! Km 78: The gap is now 5min 31 sec. White Jersey holder, 5th place in GC and winner of the Courchevel Alpine stage ahead of Armstrong, Alejandro Valverde abandonded at the feed zone. In tears he climbed into the team car. Bernard Hinault had tipped the wonderful young rider as a possible winner of this year's Tour. Yaroslav Popvych of Discovery will be the new White Jersey. Km 72: Davitamon and Lampre have the pack strung out. The gap has fallen to 6min 40sec. 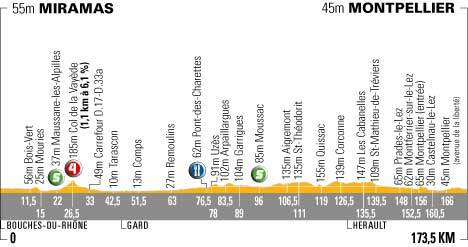 Robbie McEwen doesn't have any other real chances before Paris to let his pure speed win a bunch sprint so he wants this break brought back. 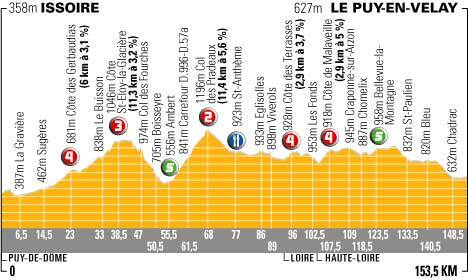 Stage 17 looks just a little too lumpy for the peloton to arrive at the finish intact. Km 58: Davitamon-Lotto and Lampre have moved to the front to try to bring things back together. The Davitamon boys are really tired after yesterday's fruitless 60-km effort to try to bring the Moncoutie/Merckx break back. Today's break got as much as 8min 45sec in front of the peloton. It's down to 7min 30sec. The first hour was brisk with the tailwind. 51 km/hr! Km 44: The break has a lead of 7min 15sec. This suits the GC teams who don't want to burn up their men the day before the Pyrenees. A group of non-contenders going up the road is just what they would have the doctor order. Km 28: Then almost immediately came the only rated climb of the day, the fourth category Col de la Vayède. Chirs Horner was first over. Also, none of the riders in the break is a contender for Michael Rasmussen's Polka Dot Jersey. The five riders have extended their lead to 2min 5sec. With the weekend's tough climbing facing the pack these boys might might be able to make this stick. This is a quality group of riders. Oops, now the gap is 3min 20sec. Km 24: After a few abortive break attempts, 5 riders got clear: Juan Antonio Flecha (Fassa Bortolo), Chris Horner (Saunier Duval), Carlos Da Cruz (FDJ), Ludovic Turpin (Ag2R) and the ever-present opportunist Thomas Voeckler (Bouygues Telecom). They have a 1min 15sec gap on the pack. 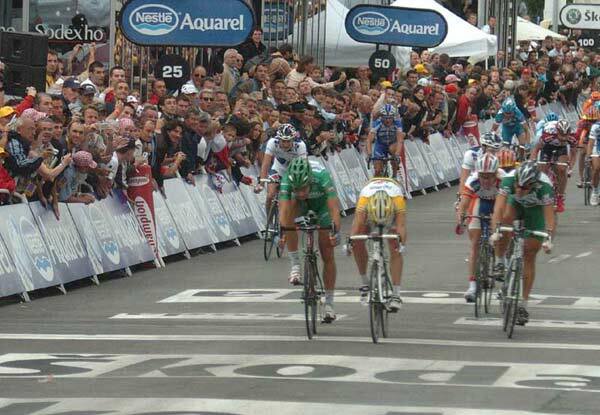 They took all the points in the first intermediate sprint which was won by Voeckler. None of the breakaways is a threat for either the Green or the Yellow Jersey. There were 162 riders at the start. No one quit over night. Yesterday, in addition to Tom Boonen's non-start, four riders abandoned: Manuel Beltran (Discovery), Nicolas Fritsch (Saunier Duval), Robert Hunter (Phonak) and Angelo Furlan (Domina Vacanze). Beltran's loss was a heavy blow to his team. He was an integral part of the Discovery plan for the mountains this weekend. 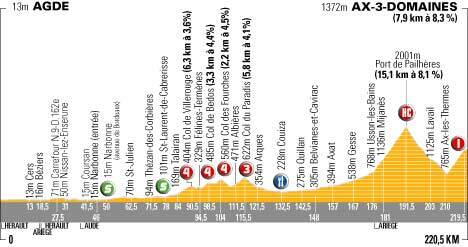 Stage 14, Saturday, July 16: Agde - Ax 3 Domaines (hilltop finish), 220.5 km. Km 219.5: Ax-3 Domaines (1,372 m), 7.9 km, 8.3% gradient, 1st Category. Weather: Hot. At the start the air was 26C (79F) and at the road level 35C (95F) and the temperature is going to climb ever hotter. No wind. The Pyrenees will be an oven today. 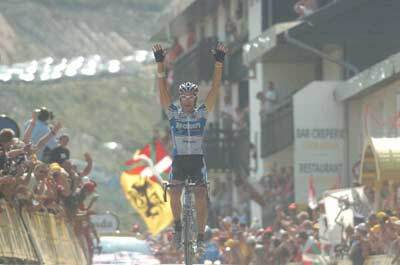 Above: Just before the finish Armstrong gets out of the saddle to drop Basso. Below: Totschnig gets the biggest win of his career. Both photos copyright Sirotti. 1. George Totschnig (Gerolsteiner) 5hr 43min 43sec. 38.491 km/hr average speed. 6. Floyd Landis (Phonak) s.t. 14. Cadel Evans (Davitamon-Lotto) s.t. 19. Leonardo Piepoli (Saunier Duval) s.t. 1. Lance Armstrong (Discovery) 55hr 58min 17sec. 43.32 km/hr average speed over the 2,440 kms covered so far. The Finish: Totschnig comes alone across the line to win the stage. His jersey is unzipped. Think the Gerolsteiner people are happy about that? 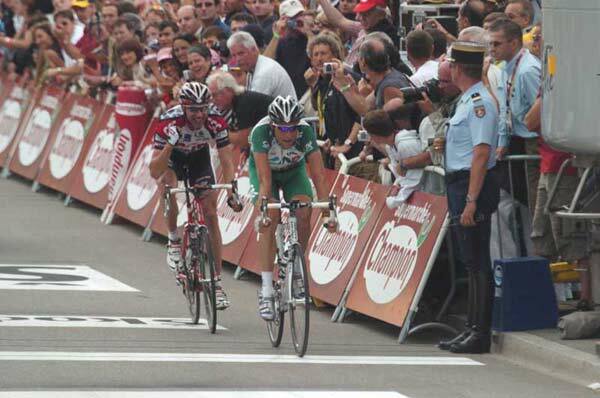 Then a minute later Armstrong leads it out and Basso can't answer. Then Ullrich. Less than 2 km to go: Armstrong got out of the saddle and raised the pace. Ullrich cracked. He's off. Basso is sticking with Armstrong. 4 km to go for the Armstrong group. Armstrong is at the front of is trio and pushing hard. Now Basso takes a pull. Totschnig is only 2 minutes up the road. He may not make it. Are Basso and Ullrich just going to finish with Armstrong and race for the Tour's podium spots? 5 km to go: It's Basso, Ullrich and Armstrong. Armstrong has moved to the front. He's got that look..... Ullrich has clearly ridden himself into shape in this Tour. They've just passed Garzelli. Only Totschnig is up the road. 6 km to go: The Armstrong group is down to Armstrong with: Ullrich, Kloden, Basso, Landis, Mancebo, Rasmussen, Leipheimer. Basso surges again, Mancebo, Kloden and Rasmussen go off. Landis and Leipheimer are gone. Km 212: Vinokourov goes through the Armstrong group and takes off alone. And now Kloden of his own team is chasing him down! I can't believe this. Can any team do a better job of seizing defeat from the jaws of victory than T-Mobile? Armstrong, Ullrich, Kloden, Basso, Mancebo, Evans, Rasmussen, Landis, Leipheimer, Zubeldia. And now Vinokourov has made it back up to the Armstrong group. Totschnig has started the final climb. Km 201: Armstrong is descending last in his group, picking his own line. Km 192: Totschnig goes over the Pailheres alone. Garzelli follows at 52sec. Garzelli is a very good descender so he may catch Totschnig.The Armstrong group is down to five, Ullrich, Basso, Armstrong, Leipheimer and Landis. They are 3min 55sec behind Totschnig. A minute back are Rasmussen, Evans, Garate, Kloden, Zubeldia and Mancebo. The hard attack at the bottom deprived Discovery of it's super team and isolated Armstrong. The others will be able to race without Discovery calling the tune. But, will it matter? Armstrong has tossed Rasmussen, Botero, Moreau and Mancebo and effectively increased his lead. Now the big 5 go over. There will he a hairy desecnt as the dropped riders will take terrible chances to get back into the fight. Km 189: The attacks have eased a bit and the Armstrong group is now 6: Nardello, Ullrich, Armstrong, Leipheimer, Landis and Basso.Vinokourov, has clawed back up to the Rasmussen chase group. Now Armstrong goes to the front and brings up the pace. He wants Rasmussen gone, long gone. Km 188: Basso is on fire! He just keep pounding. Armstrong looks unstressed. Behind Basso, Ullrich, Landis and Armstrong is a chase of Kashechkin, Evans, Mancebo, Rasmussen and Kloden 1min 20sec back. Vinokourov is further back. Up front, Totschnig has dropped Garzelli. 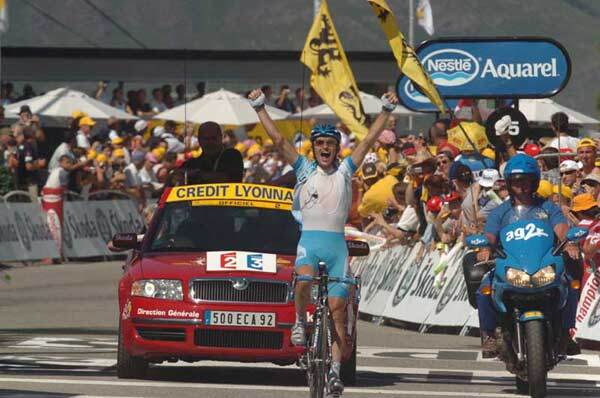 Armstrong just took a bottle from Bruyneel in the Discovery car. Should be against the rules. A little penalty tonight? Km 185: Basso keeps surging and has it down to 4: Landis (! ), Armstrong, Ullrich and Basso. Up at the real front of the race, the break is down to Garzelli and Totschnig.They are a little over 4 minutes ahead of the Armstrong group. Rasmussen is at least 40 seconds behind the Armstrong group. Km 183: Now it's 4 at the front: Basso, Armstrong, Ullrich and Moreau. Vinokourov has fallen of to the second group a few seconds back. And then it's 7 again. This is hot. No, it's not Moreau in the Credit Agricole colors, it's Andrey Kashechkin. Rasmussen is not in the front group. Km 180: Vino goes, then Basso counters. Armstrong is not moving out of the small group. 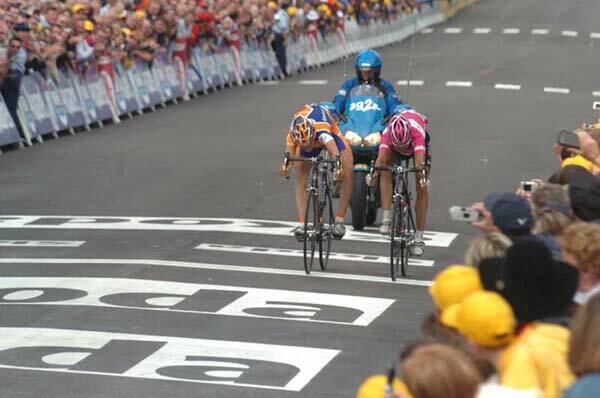 Armstrong easily closes the gap up to Ullrich, Vino, Basso and Moreau. No sign of weakness from Armstrong or any of the others. Rasmussen and Mancebo are riding up to the Armstrong group. Vinokourov is looking to be in a bit of bother. Now here is Cadel Evans. Km 178: Guerini took a big pull. The pack shatters. Armstrong has no teammates. Vinokourov goes. 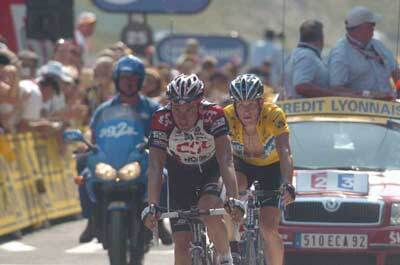 Ullrich drags Armstrong back up to him! 10 riders left. Basso is there. Popovych is fighting to get back up. Km 178: As soon the the climb began to bite the break came apart. Alexandre Moos took off. Krivtsov, Da Cruz and Grivko are shelled. The peloton is strung out. The gap is 7min 30sec. T-Mobile has gone to the front of the peloton and is whipping up the speed. Moos gets caught so at the front it's Garzelli, Moos, Beneteau and Totschnig. Km 173: On the lower slopes of the hors category Port-de-Pailhères. There are still several unzipped (it's hot!) orange Euskaltel jerseys at the front of the peloton with Discovery right behind. The break looks organized with the riders taking short pulls. The gap is down to 9min 27sec. Bradley McGee (FDJ) looks to be having trouble at the back of the peloton. Km 160: Euskaltel has sent three riders to the front to help Discovery peg and bring back the break. This is near Basque territory and Euskaltel may be wanting a home-town win. I'm sure we'll see the fanatical Basque fans on the climbs. The gap has grown to 9min 50sec. Km 140: The gap is now 9min 20sec. The third hour of racing covered 40.2 km. The average speed for the first three hours was 44.5 km/hr. Km 123: The series of minor climbs have been completed. Around the 7th kilometer 10 riders got away. They now have a gap of 9 minutes. They are: Daniele Nardello (T-Mobile), Alexandre Moos (Phonak), Juan Manuel Garate (Saunier Duval), Stefano Garzelli (Liquigas), Walter Beneteau (Bouygues Telecom), Georg Totschnig (Gerolsteiner), Carlos Da Cruz (FDJ), Philippe Gilbert (FDJ), Andriy Grivko (Domina Vacanze) and Yuriy Krivtsov (Ag2R). The best place rider is Totschnig, sitting in 22nd place, 11min 43sec behind Armstrong. While Garzelli is the 2000 Giro winner and this years Romandie points winner, he is not having a Tour that is up to his usual abilities being 14min 21sec down, in 26th place. 160 riders started today. Rabobank's Gerbin Lowek will not ride today. So far there have 29 abandons. The remaining complete teams: T-Mobile, Cofidis, Bouyges Telecom, Gerolsteiner and Euskaltel. Stage 15, Sunday, July 17: Lézat sur Lèze - Saint Lary Soulan (Pla d'Adet) (Hilltop finish), 205.5 km. This is it. 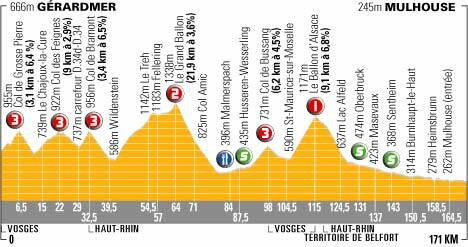 The Queen Stage with climbs that echo down the history of the Tour. It was on the Portet d'Aspet in 1934 that Rene Vietto, upon learning that Antonin Magne, his team captain, had crashed, turned around and rode back up the mountain against the tide of descending riders to give Magne his bike. It was on the Col de Mente that Luis Ocana famously crashed in terrible weather and thereby lost the Yellow to Merckx in 1971. The Peyresourde was included in the 1910 Tour, the year Tour founder Henri Desgrange first included high mountains. And it was at St.-Lary Soulon in 1974 that the 38-year-old Raymond Poulidor came in alone, almost 2 minutes ahead of the yellow jersey'd Eddy Merckx. This should be an awesome day of racing. 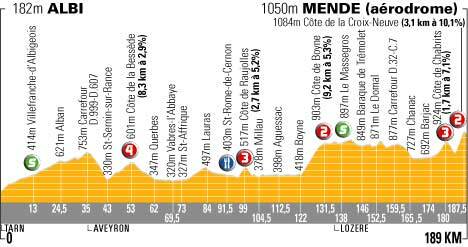 With the Tueday's Pyreneen stage's (Monday is a rest day) big climb 70 km from the finish, this is the last time the climbers have a real chance to get time. Weather: It was 23C (73F) at the start with some clouds but it is promising to be another very hot day in the Pyrenees. Above: Hincapie gets his first Tour stage win. Middle: Pereiro leads Hincapie in the final meters before the sprint. Below: Basso and Armstrong come in together. Fotoreporter Sirotti pictures. 9. Jan Ullrich (T-Mobile) s.t. 11. Francisco Mancebo (Illes Balears) s.t. 16. Cadel Evans (Davitamon-Lotto) s.t. 1. Lance Armstrong (Discovery) 62hr 9min59sec. 42.309 km/hr average speed for the 2,645.5 km covered so far. 5. Illes Balears @ 32min 9sec. The finish: Hincapie comes off Pereiro's wheel and gets his first Tour stage win. I know he's paid to win races and they are all professionals, but it sure doesn't feel heroic with his having sat on the break and especially on Pereiro all the way up the mountain. OK, I'm the skunk at the picnic. I just read another commentary that called Hincapie's victory being well-deserved and Bruyneel is making noises about Hincapie being the Discovery team leader next year. So, a truly nice, hardworking guy gets the biggest win of his life. 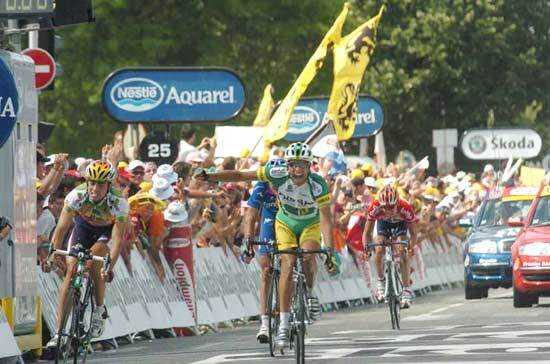 Basso leads Armstrong over the line. There is no contest. Armstrong gets his 77th Yellow Jersey, just 1 behind Bernard Hinault's 78. 1 km to go: Pereiro is still doing all the work with Hincapie on his wheel. Km 202: Pereiro has to do all the work as Hincapie sticks to his wheel as they go under the 2 km banner. Tactical, but not pretty. Km 201: Caucchioli attacks. Pereiro closes the gap and passes him. Hincapie bridges up to him. Pereiro is doing all the work. Ullrich isn't gaining or losing, about 15 sec behind Armstrong and Basso. Basso is leading Armstrong, both of whom look good. Km 200: Pietro Caucchioli made it back up to Boogerd, Hincapie and Pereiro up front who are 6min 30sec ahead of Armstrong. Ullrich has held his gap to Basso and Armstrong to about 50 meters. Armstrong is leading Basso as they pass dropped break rider Allan Davis. Km 196: On the slopes of the final climb. The crowds are huge! Bam!!! Basso goes. Big gap. 1, 2, 3, no one does anything. Armstrong sprints up to him and they are together racing for the top of the mountain. Ullrich is alone. Oscar Pereiro (T-Mobile) attacks the break and gets a small gap. Pereiro easily catches him and blows right on by. Boogerd drags Hincapie up to him so now the lead break is three. They still have a lead of 7min 30sec on the Armstrong group. They might make it. Armstrong's group has picked up two riders from the break, Bertogliati and Pineau. They should get dropped as soon as they hit the final mountain. Rasmussen is losing second place to Basso. Km 191: Rasmussen's group went over the top over a minute behind Armstrong. Km 183: The break, still 6 riders, has gone over the Col de Val Louron. Then, 7min 48sec back is the Armstrong group. Just behind Armstrong, Basso and Ullrich is a chase group of: Rasmussen, Mancebo, Landis, Piepoli, Vinokourov and Leipheimer. No time checks yet to them. They'll probably get back on the descent for the final fight on the climb to Pla d'Adet. Km 181: Ullrich struggles back up to the pair. Basso looks back and sees Ullrich and lifts the pace. Ullrich stays with them. Rasmussen is clearly gone. Now Ullrich goes to the front. The break has lost a lot of time with the hot pace behind. The gap is down to 9 minutes. Km 179: Vinkourov goes to the front and lifts the pace. Rubiera is tossed. Ullrich is right on Vino's wheel.Armstrong is right there. Bam! Basso hits them. He's gapped Ullrich. 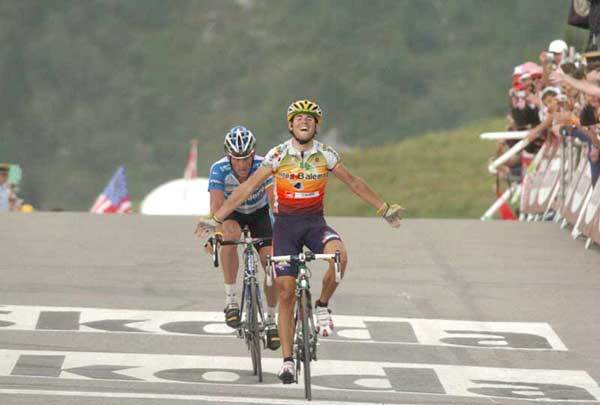 Armstrong goes around Ullrich. Ullrich closes the gap. Basso pours on the gas. Only Armstrong can go with him. They have wings and are flying away. Now Armstrong takes over. Km 178: Several riders made it back up to the Yellow Jersey group. Savoldelli, Julich and Sastre are there to work for their team. Sastre has gone to the front. The break still has 12 minutes. Oh, Sastre's pull has tossed his teammate Julich. Now T-Mobile's Guerini has gone to the front. His work has caused Kloden and Savoldelli to come off. The Col de Val Louron has started to rise. Now Contador, Jaksche are off. Km 170: The 6 breakaways went over the top led by Laurent Brochard 11min 30sec ahead of what is left of the peloton of 18 riders: Armstrong still has 3 teammates. Ullrich, Landis, Rasmussen, Basso, Vinkourov, Kloden, Horner, Mancebo and Leipheimer are still there. 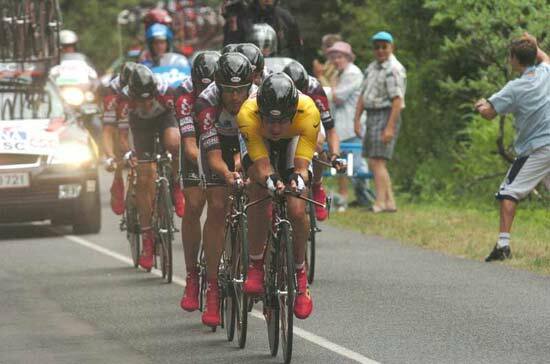 Cadel Evans has clawed his way back up to the Armstrong group. There will be some regrouping before the race hits the penultimate climb. Km 156: CSC now has help from T-Mobile. The pace of the peloton on the Peyresourde is just blisteringly fast. CSC's Sastre is just pounding at the front. Savoldelli is staying right there at the front with Armstrong just behind. It looks like about 25 riders left in the peloton. The gap to the break is 14min 39sec. Savoldelli is moving back but maintaining contact. All the big dogs look to be there. Armstrong still has Azevedo, Rubiera and Popovych with him. Sastre is cooked and is off. Savoldelli has become detached as well. Cadel Evans is in trouble. Km 150: The break has started riding the Peyresourde. It isn't too steep here. Karsten Kroon is pounding at the front in the big ring with Boogerd right with him. Allan Davis and Iker Camano have come off the break. Bertolini had been see-sawing off the break and now he's gone again. This time, I think for good. And now Kroon is finished and drops off the break. The break, with a lead of 16min 25sec is down to 6: Boogerd, Pereiro, Brochard, Sevilla, Hincapie and Caucchioli. Km 140: The break is flying down the hill. CSC's Nicki Sorensen and Carlos Sastre are leading the peloton up the mountain with Discovery's Savoldelli right behind them. Armstrong is sitting about 5th. Then, lurking is Ullrich and T-Mobile. The pelton is rapidly shrinking. One victim of the increased pace on the mountain is yesterday's winner, Georg Totschnig. He was just dropped. Km 136: Near the crest of the Portillon. Karsten Kroon has been leading the break up the mountain. CSC is leading the chase of the peloton which is now 16min 34sec back. Km 119: As the break goes through the feed zone Discovery leads the peloton over the crest of the Col de Mente 18min behind. Km 100: Over the top of the Col de Mente: Rabobank has 3 riders in the break and are very motivated to make it work. They might be a help to Rasmussen if and when the GC riders catch them. None of the riders in the break is a threat to the points or climber's competition either. The pack can't be hammering the climbs too hard since Discovery's big boys Padrnos and Noval are leading the peloton. The gap is now 18min 5sec. Dekker, Kroon and Boogerd led the break over the Col de Mente, sweeping up all the climber's points, denying them to any of the current Polka Dot Jersey holder Rasmussen's competitors. Km 97 on the Col de Mente: All 160 of yesterday's finishers started today, no overnight withdrawals. It was an aggressive start with attempts to get away being initiated and being caught. At km 29, 14 riders went clear: George Hincapie (Discovery), Oscar Sevilla (T-Mobile), Michael Boogerd (Rabobank), Erik Dekker (Rabobank), Karsten Kroon (Rabobank), Oscar Pereiro (Phonak), Rubens Bertogliati (Saunier Duval), Allan Davis (Liberty Seguros), Pietro Caucchioli (Credit Agricole), Laurent Brochard (Bouygues Telecom), Jerome Pineau (Bouygues Telecom), Bertolini (Domina Vacanze), Iker Camano (Euskaltel) and Mikel Astarloza (Ag2R). The best placed rider in the break is Oscar Pereiro sitting 24th @ 24min 40sec. Discovery is leading the peloton which seems very unworried about the break. The gap is 17min 20sec. Stage 16, Tuesday, July 19: Mourenx - Pau, 180.5 km. The is the final day in the Pyrenees. 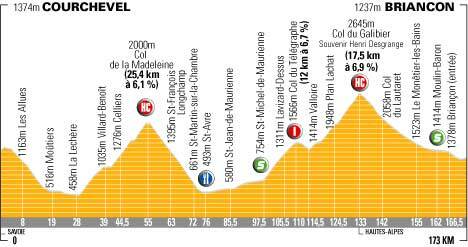 With the major climb of the day, the mighty Aubisque coming 60 kilometers from the end, there shouldn't be any change in the top of the GC. We'll probably see a break of non-threatening riders, however. Phonak's Pereiro is still burning from his narrow loss in stage 15. I'll bet he's out there. The Aubisque was the final climb in the second day of mountains in the 1910 Tour, the first year the Tour had included the high mountains. Shattered, walking his single-speed bike up the dirt road that was the ascent of the Aubisque, Octave Lapize, the winner that year, met some Tour officals. Barely able to even find the strength to talk, he vented his outrage at being forced to perform such an inhuman task. 'You are assassins, yes, assassins (Vous êtes des assassins!)' he said. Km 118.5: Col du Soulor (1,475 m ), 2 km, 5.5% gradient. not rated, no climbers points. Weather: The air is 25C (77F) but at the road it's 33C (91F). Another really hot day. There are some clouds but rain is very unlikely. 2. Xabier Zandio (Illes Balears) s.t. 3. Eddy Mazzoleni (Lampre) s.t. 4. Cadel Evans (Davitamon-Lotto). s.t. 7. Jorg Ludewig (Domina Vacanze) s.t. 8. Juan Antonio Flecha (Fassa Bortolo) s.t. 9. Ludovic Turpin (Ag2R) s.t. 10. Cedric Vasseur (Cofidis) s.t. 15. Pierrick Fedrigo (Bouygues Telecom) s.t. 17. Fabian Wegmann (Gerolsteiner) s.t. 19. Salvatore Commesso (Lampre) s.t. 20. Maxim Iglinskiy (Domina Vacanze) s.t. 1. Lance Armstrong (Discovery) 66hr 52min 3sec. 42.043 km/hr average speed over the Tour's 2,826 kms covered so far. 5. Illes Balears @ 28min 45sec. The Finish: Evans doesn't let up. He's leading it out. Oscar Pereiro comes off his wheel and takes the win. Pereiro let Evans do all the work in the last 3 kilometers and came off his wheel. Can he complain about Hincapie any more? Evans lifts himself to 7th in the GC. The times are close in the 4th through 9th place, espceially 6th through 8th. It will make Saturday's 55km individual time trial very interesting. Gilbert got away alone and crossed the line for 5th by a couple of meters ahead of the other remaining breakaways. Laurent Brochard takes the field sprint. Nope, Liquigas' Franco Pellizotti gets it. 4 km to go: Evans is doing more work than the rest of his companions combined. He is riding for time, not a stage win. The peloton is 3min 26sec back. Km 169: The gap from the peloton to the Evans group is down to 4min 27sec. Evans is pounding away with all he's got. Just behind Philippe Gilbert attacked his chase group and has been joined by what looks like Jerome Pineau. The pair are 1min 39sec behind Evans. Km 158: The break of Evans, Mazzoleni, Pereiro and Zandio is being immediately chased by 8 riders who are 1min 46sec behind: Serrano, Ludewig, Vasseur, Geslin, Pineau, Gilbert, Flecha and Turpin. The peloton, which is still strung out, is 4min 57sec back. Km 146: The peloton has sobered up a bit. The Evans break has a lead of 6min 50sec. He is threatening the position of even Jan Ullrich now. T-Mobile, Gerolsteiner and Rabobank are at the front and stringing things out. Km 129: Eddy Mazzoleni and Oscar Pereiro caught Evans. Hard-luck Pereiro flatted! Mazzoleni and Evans pressed on. Pereiro was caught by Xabier Zandio. They chased and caught Mazzoleni and Evans. They are now 4 riders who have a good chance to make it to the end. They are about 5min 30sec ahead of the peloton which has grown rather large and is descending in a rather leisurely fashion. Caught between the Evans break and the peloton are: Vasseur, Geslin, Gilbert, Flecha, Pineau and Turpin. Km 116: Evans is on the Soulor. Behind, the Armstrong group, led by Armstrong is not doing a crazed descent. Armstrong is probably keeping it slow. Hincapie is back on and Popovych is coming. Km 110: Vinokourov attacks again. Armstrong is not worried and Vino is brought back. At the crest of the Aubisque, Rasmussen is taking off for the KOM points. They catch Chris Horner who was dropped out of the original break. There will be a regrouping on the descent. Km 108: Ullrich hits the front really hard. He breaks it up and then it comes together except for Francisco Mancebo, Kashechkin and Hincapie. They sweep up Vinokourov and Heras. Evans crests the Aubisque alone. Oscar Pereiro goes over alone a lttle behind Evans. They have 80 kilometers to go. Km 105: Evans still has a 30 sec gap. Back a bit, Roberto Heras has bridged up to Vinokourov. It looks like the Armstrong group is down to Ullrich, Basso, Sastre, Mancebo, Rasmussen, Landis, Kashechkin and Leipheimer. Several of these riders can't be happy about Evans up the road riding into a higher placing. Rasmussen and Basso surely want to try to put some distance between themselves and Ullrich, given the German's superb time-trial abilities. Hincapie has made it up to the Armstrong group. Km 103: Evans has attacked the lead break. Julich, Kloden, Ullrich and Sastre have tried to get away from the Armstrong peloton, but all were brought back. T-Mobile is leading. Now Hincapie is at the front. Vinokourov, alone, is chasing the Pereiro group. Ullrich's attack did have the effect of really thinning out the peloton. Km 99: On the slopes of the Aubisque. At km 26, 11 riders went clear. 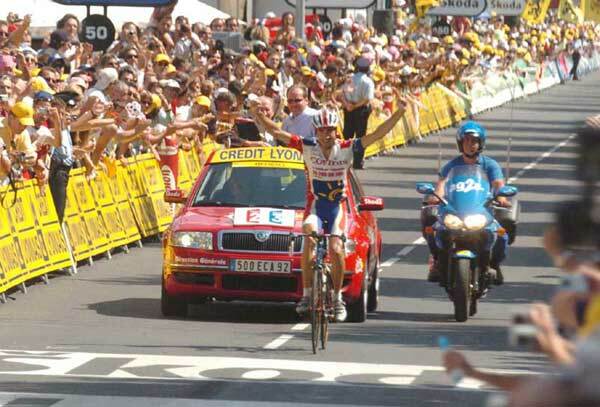 There are still 10 of them away (Fred Rodriguez was in the group but was dropped): Xabier Zandio (Illes Balears), Cadel Evans (Davitamon-Lotto), Juan Antonio Flecha (Fassa Bortolo), Chris Horner (Saunier Duval), Cedric Vasseur (Cofidis), Anthony Geslin and Jerome Pineau (Bouygues Telecom), Philippe Gilbert (FDJ), Jorg Ludewig (Domina Vacanze) and Ludovic Turpin (Ag2R). 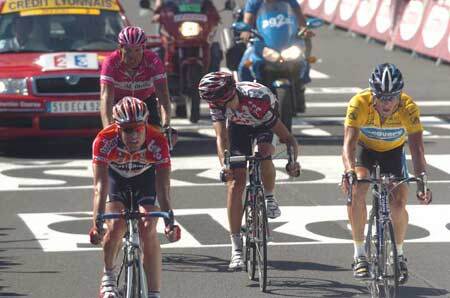 Cadel Evans is the best placed rider in the group, 11th, 12min 57sec behind Armstrong. If he makes this stick he will really move up in the GC. Chasing, a couple of minutes behind them are: Marcos Serrano (Liberty Seguros), Oscar Pereiro (Phonak) and Eddy Mazzoleni (Lampre). The Yellow Jersey group is about 7 minutes behind the lead group of 10. 156 riders started today. Two withdrawals, Liquigas' Magnus Backstedt and Lampre's Gianluca Bortolami. Stage 17, Wednesday, July 20: Pau - Revel, 239.5 km. This is the longest stage of the Tour. Its sawtooth profile will beg for a breakaway. I think there are still ten teams who have not yet won a stage in this year's Tour, so some Directors must be getting very hungry. Tuesday's win by Oscar Pereiro broke Phonak's drought. With a 55 km individual time trial coming up Saturday, the GC boys will be trying to avoid any needless expenditure of energy. The weather: It will be hot again. At the start of the stage the air was 22C (72F) and at the road level it was 30C (80F) with no wind. The temperature is expected to really climb. 1. Paolo Savoldelli (Discovery) 5hr 41min 19sec. 42,101 km/hr average speed. 7. Bram Tankink (Quick Step) s.t. 11. Pierrick Fedrigo (Bouygues Telecom) s.t. 12. Dario Cioni (Liquigas) s.t. 13. Jose Luis Rubiera (Discovery) s.t. 14. Carlos Da Cruz (FDJ) @ 4min 9 sec. 15. Erik Dekker (Rabobank) s.t. 16. Stephane Auge (Cofidis) s.t. 17. homas Lovkvist (FDJ) s.t. 19: Alexandre Vinokourov (T-Mobile) s.t. 20. George Hincapie (Discovery) s.t. 28: Stuart O'Grady (Cofidis) @ 22min 48sec. Moreau, Evans and Landis were also in this group. 1. Lance Armstrong (Discovery) 72hr 55min 50sec. 41.823 km/hr average speed over the 3,056 km covered so far. 19. Andrey Kashechkin (Credit Agricole)s.t. 5. Illes Balears @ 53min 52sec. The finish: Back in the peloton T-Mobile pounded with Ullrich taking a huge pull near the crest of the hill with Armstrong and Popovych taking over. A lot of big names were caught sleeping and are off. Landis and Evans are off. Vinokourov takes a huge pull. Now Popovych and Hincapie are pulling this small elite group. Now Armstrong is taking monster pulls. Moreau, Evans and Landis missed the move. Popovych takes the sprint from this group. The Evans group comes in 20 seconds later. Savoldelli just keeps digging deeper and deeper to try to get Arvesen back. He doesn't give up. He claws slowly up to Arvesen, gets on his wheel than slowly comes next to him then a bit ahead. Savoldelli gets the stage win. 2 km to go: Arvesen and Gerrans catch the pair. Hinault looks like toast. Arvesen goes now and Savoldelli hesitated a bit to take up the chase. Km 232: Savoldelli looks for help from Hinault and Hinault says in body language, I don't have any more. Savoldelli keeps pounding. Now Hinault helps. Gerrans and Arvesen are 6 seconds behind them. Km 230: As expected, on the final climb Tankink attacked. Hinault bridges and goes right on past. Now Giro winner Savoldelli goes after Hinault and makes it. They are now two together with a good gap. Hinault will go down the hill with Savoldelli. That will curl his hair given Savoldelli's superb skills going downhill. T-Mobile has 5 riders at the front of the peloton. Too little too late. Km 225, 14 to go: The front eight are 2min 15sec ahead of the chasing 9 riders. The peloton is now being led by T-Mobile, over 24 minutes back. The competition for the Green Jersey is tight enough that the sprinters will fight hard for the 18th place that's left to the peloton. Km 207: The front break of 8 is working very well together and extending their lead. They are all taking short, really hard pulls. The lead is now a full minute. Dekker has been caught by the chasing group which is made up of Rubiera, Dekker, Davis, Cioni, Auge, Fedrigo, Da Cruz, Lovkvist and Dumoulin. Dekker and the 2 FDJ's are working hard to bring the break back. The peloton is over 22 minutes back, still led by 2 Credit Agricole riders. Km 197: 7 riders have made it up to Grivko. Dekker was caught back and is trying to bridge. He's got a tough solo ride. The chasing members of the break haven't organized and have relaxed their chase a bit. The 8 riders working hard together at the front are: Tankink, Sevilla, Savoldelli, Arvesen, Hinault, Righi, Grivko and Gerrans. FDJ, who had 2 riders in the orginal break have blown it. Neither of their riders (Da Cruz and Lovkvist) are in the front group of 8. Km 189: Bam!!! Erik Dekker attacks the break and gets a huge gap with a very powerful effort. His compatriot Bram Takink bridged up to him. They were brought back and Grivko counter-attacked. He's a good time trialist. The gap had grown to 24min 20sec. But now Credit Agricole has sent two riders to the front to keep the break from running away. It's now 23min 23sec. Oscar Sevilla will push Credit Agricole's out of the top ten in the GC. Moreau is the best-placed French rider in the Tour. Km 171: The peloton is still apathetic. The gap is 21min 56sec. Discovery continues to lead the pack. It is in their interests to let the break go. With the withdrawal of T-Mobile's highly placed Andreas Kloden and with Discovery having two riders in the break compared to T-Mobile's one rider, the leadership in the Team GC competition will also go to Discovery. That will give Discovery leadership in the Individual General Classification, Young Rider and the Team GC. That leaves T-Mobile with nuthin'. Km 160: The gap is now 20 minutes. Km 142: The gap has grown to 17min 38sec. The best placed rider in the break is Oscar Sevilla (T-Mobile). He is sitting 25th, 38min 51sec behind Armstrong. 7 teams don't have riders in the break: Illes Balears, Davitamon-Lotto, Phonak, Fassa Bortolo, Saunier Duval, Gerolsteiner and Euskaltel. Discovery and Rabobank, who both have two riders each in the break, are leading the peloton. There doesn't seem to be too much interest in chasing them down. Km 126: There are 17 riders away with a 12 minute lead on the peloton. On the first climb at km 22, French champion Pierrick Fedrigo took off. He was joined by Kurt-Asle Arvesen, then Carlos Da Cruz, then Erik Dekker made it up to him. Finally, as riders crossed the gap the group swelled to 17. They are: Jose Luis Rubiera (Discovery), Paolo Savoldelli (Discovery), Oscar Sevilla (T-Mobile), Kurt-Asle Arvesen (CSC), Erik Dekker (Rabobank), Allan Davis (Liberty Seguros), Sebastian Hinault (Credit Agricole), Dario Cioni (Liquigas), Stephane Auge (Cofidis), Bram Tankink (Quick Step), Peirrick Fedrigo (Bouygues Telecom), Daniel Righi (Lampre), Carlos Da Cruz (FDJ), Thomas Lovkvist (FDJ), Andriy Grivko (Domina Vacanze), Samuel Dumoulin (Ag2R ), Simon Gerrans (Ag2R). 156 riders started with no overnight withdrawals. After a few kilometers into today's stage T-Mobile's Andreas Kloden abandoned. He broke a bone in his wrist in a crash yesterday as was unable to continue. Stage 18, Thursday, July 21: Albi - Mende, 189 km. It will break up on this stage. And with 3 kilometers of 10% gradient at the very end, look to see if Ullrich can put some distance between himself and the others like he did Wednesday. These final days of the Tour are really hard with the undulating terrain of France's Massif Central. The Weather: Another very hot day. At the start the air was 25C (75F) and at the road level it was 33C (91F). It will get hotter. There is a light breeze and an almost cloudless sky. Above: Serrrano crests the final hill before coming in for a wonderful win. Below: Evans, Ullrich, Basso and Armstrong have gapped the Rasmussen group. Basso looks back to see the damage. Sirotti photos. 1. Marcos Serrano (Liberty Seguros) 4hr 37min 36sec. 40.85 km/hr average speed. 7. Luke Roberts (CSC) s.t. 12. Lance Armstrong (Discovery) s.t. 14. Jan Ullrich (T-Mobile) s.t. 16. Michael Rasmussen (Rabobank) s.t. 18. Francisco Mancebo (Illes Balears) s.t. GC after stage 18. Armstrong collects his 80th Yellow Jersey. 1. Lance Armstrong (Discovery) 77hr 44min 44sec. 41.664 km/hr average speed over the 3,254.5 kms covered so far. 5. Illes Balears @ 55min 12sec. The finish: Armstong leads it out. Evans takes that group sprint. The Rasmussen group comes in 36 second later. Now Ullrich is off. It's Basso driving hard with Armstrong and Evans. And Ullrich struggles back. Back in the peloton on the Croix Neuve climb: it has totally broken up. 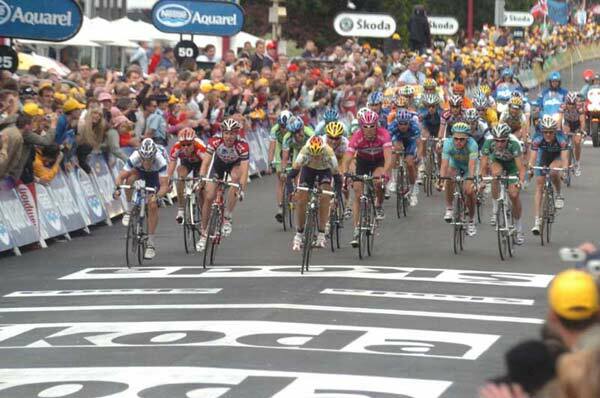 At the front are the big dogs: Armstrong pounding at the front with Basso, Ullrich, Basso and Evans. Rasmussen, Vinokourov and Leipheimer are a bit back. Serrano clears the summit looking back with his 14 seconds intact. He zips up his jersey. Clear hands-off the bars win for Marcos Serrano. Cedric Vasseur takes the second place from Merckx. Pellizotti beats Zandio for 4th. Nope. Correction Zandio gets it. Km 185: Merckx attacks, Pelizzotti and Zandio are tossed. More heat from Merckx. Voeckler goes back. Km 180: Vasseur, Zandio and Serrano have made it up to Voeckler and Merckx. Now the tough Croix Neuve climb will sort things out. Franco Pellizotti has joined the 5. Km 178: The break riders just keep riding hard tempo. And now Zandio and Merckx go. Merckx goes right by the other two and has a gap. Da Cruz is caught and spit out. And now Thomas Voeckler jumps and gets up to Merckx. The two of them have a gap of about 30 meters. 15 minutes back, CSC has gone to the front of the peloton, and is whipping up the pace. Km 177: There it is. Carlos Da Cruz (FDJ) takes off from the break. He gets a 10 second gap. As he begins the Chabrits climb he has 23 seconds on the other 9. Km 168: We've got two stiff climbs before the finish. Will the attack go on the penutlimate climb, the Chabrits, or will they hold their fire until the Croix Neuve? And how about Ullrich and the rest fighting to improve their places? The fireworks are coming, that's for sure. The gap just dropped a few seconds below 15 minutes. Now the gap has grown to 15min 19sec. Km 159: The gap has grown to 15 minutes. Paul Sherwin has just told OLN TV that there is a 15% gradient patch in the final climb to the finish. That will make it hard for the riders trying to preserve their top-ten GC postions if they aren't super-alert. 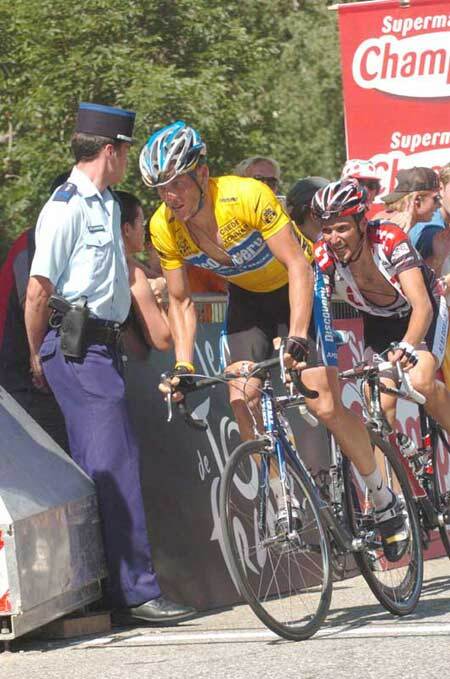 Lance Armstrong made a few comments to the TV audiences while he was riding near the front of the peloton. After saying that he was feeling OK for an old man, he tipped Axel Merckx to win the stage. He knows the break isn't going to get caught, they're his riders at the front of the pack. So far all the riders in the break are sharing the work. Km 147: The break of 10 riders has extended its lead to 13min 41sec. All the riders seem to be working. The peloton is led by 4 Discovery domestiques followed by Armstrong. CSC is now right behind them. Benjamin Noval of Discovery seems to be doing the lion's share the work at the front. Km 128: On the 2nd category Cote de Boyne the break is riding the climb at a moderate pace, non-climber Thomas Voeckler is still there. Merckx and Kessler are doing most of the work in the break at this point. Discovery is still leading the pack with Gerolsteiner right behind them. Km 115: At the first intermediate sprint Alexandre Vinokourov joined an escape group Christophe Moreau and Davitamon's Van Summeren Vinkourov came in second to Van Summeren in the sprint. Moreau and Vinokourov wanted and grabbed the bonus seconds up for grabs. Their break was neutralised. Just after that sprint at km 20 a break went. A few riders then joined it and now it has a lead of 12min 2sec. The 10 riders escaping the Discovery-led peloton: Matthias Kessler (T-Mobile), Luke Roberts (CSC), Xabier Zandio (Illes Balears), Axel Merckx (Davitamon-Lotto), Marcos Serrano (Liberty Seguros), Oscar Pellizotti (Liquigas),Cedric Vasseur (Cofidis), Thomas Voeckler (Bouygues Telecom),Carlos Da Cruz (FDJ), Egoi Martinez (Euskaltel). The best placed rider in the break is Zabier Zandio, 25th @ 39min 40sec. The race has been fast so far. The average speed for the first two hours was 46 km/hr. Stage 19, Friday, July 22: Issoire - Le Puy en Velay, 153.5 km. This should be interesting. The big 55-kilometer individual time trial is tomorrow, so there will be the instinct among the GC contenders to ride to save energy. Yet, any opportunity to open up a gap in time will be taken as we saw yesterday when Ullrich dropped Rasmussen and Landis in the last climb. As the great Tour winner of the 1930's Antonin Magne said, "The Tour is not over until the last pedal is turned." The weather: Hot, hot, hot. At the start the air was 27C (81F) and at the road it was 40C (104F). Its going to get hotter through the day. And it is a bit windy, in the rider's faces or crosswinds. Giuseppe Guerini times it perfectly and gets a clean win. Sirotti photo. 8. Bert Grabsch (Phonak) s.t. 9. Sylvain Chavanel (Cofidis) s.t. 12. Carlos Da Cruz (FDJ) s.t. 13. Juan Antonio Flecha (Fassa Bortolo) s.t. 15. Thor Hushovd (Credit Agricole) s.t. 16. Stuart O'Grady (Cofidis) s.t. 17. Allan Davis (Liberty Seguros) s.t. 19. Rafael Nuritdinov (Domina Vacanze) s.t. 20. Francisco Mancebo (Illes Balears) s.t. GC after stage 19. Armstrong collects his 81st Yellow Jersey. 5. Illes Balears @ 59min 43sec. The finish: Guerini took off just before the end for a solo flyer. He made it stick and so T-Mobile's Guerini wins the stage. Commesso also attacked just before the end and beat his companions to the line for 5th place. Robbie McEwen beat Thor Hushovd for the field sprint. My apologies for the gap in the updates, but I had to take a vital phone call. Km 135: Chavanel has made contact with Commesso. They are quickly moving away from the other 7. The four leaders are 2min 20sec ahead of Commesso and Chavanel. The pack is 6min 35sec behind the four leaders. Km 123: Commesso goes again and this time takes Grabsch and DaCruz with him. Sylvain Chavanel has joined them. The peloton is 7min 5sec behind the four leaders. And now Commesso has all of his original breakaway companions except Bertolini. Commesso tries again at the 25km to go banner. He got a gap with Chavanel chasing 30 meters back. The others are scrambling but don't seem very organized. Km 113: Commesso took Flecha, Chavanel, Grabsch and Weening with him. Grabsch is Phonak, so he won't work. Commesso is a very good sprinter so he wants up to the four leaders very badly. The five chasers have shrunk the gap a bit. The gap to the front break is 1min 41sec. The peloton is 7min 25sec behind the leaders. Gerolsteiner sent a rider to the front of the peloton to help. And now here are Cadel Evans' Davitamon boys also lending a hand. Now the gap from the peloton is 7min 12sec. Commesso has his passengers back as the chasing group has come back together. Km 108: In the chase group of ten, Salvatore Commesso is disgusted with the lack of unified effort to chase down the 4 leaders. There are just too many who won't work. He attacks on the final climb, the Malaveille, and causes a real split. The gap to the 4 is now down to 1min 44sec. Back in the peloton, the efforts of Illes Balears are starting to pay off, their gap is down to 8min 30sec. Km 100: The gap is touching 9 minutes. Illes Balears has sent 5 riders to the front. They don't want their Francisco Mancebo to lose his 5th place in GC so they have started working to halt the time losses. Km 94: The gap has grown to 8min 27sec and Pereiro is now the virtual 7th, displacing Cadel Evans. It is amazing to see the teams letting this happen. Pereiro is working like a dog. He knows what he is gaining to day. The 10-man chase group is 2min 5sec behind the leading four. Km 83: The peloton is now 6min 33sec beinhd the 4 leaders. If they hold that gap, that puts Pereiro ahead of Moreau in the GC and threatens Vinkourov and Landis. I would expect T-Mobile and Credit Agricole to start working to close the gap. Since Landis and Pereiro are both Phonak, I don't expect Phonak to do any work. Now the gap is 7min 13sec and Discovery is still at the front without any help. Pereiro is now the virtual 8th man, now ahead of Vinokourov, in GC. Km 67: The lead group continues to work very well together. On the Pradeaux climb there was some discord in the chasing 10 with Arvesen calling to the others that they should get organized and get a move on. At least that's what it looked like he was telling them. Commesso, feeling that things weren't working took off. Rabobank's Weening went to the front of the 10 and started setting a warm pace. That caused Chavanel, Flecha and Bertolini to come off, but they rejoined on the descent. The peloton with at least 6 Discovery riders at the front is 4min 30sec behind the leaders. The 10 chasers are 2min behind the leaders. Km 60: On the 2nd category Pradeaux the gap has really grown. Discovery probably wants these guys to just go and let them ride conservatively and save their energy. The 10 chasers are 46 seconds behind the Guerini lead group of 4. The peloton is over 4 minutes back.The 10 chasers are: Jose Azevedo (Discovery), Kurt-Asle Arvesen (CSC), Bert Grabsch (Phonak), Juan Antonio Flecha (Fassa Bortolo), Sylvain Chavanel (Cofidis), Salvatore Commesso (Lampre), Carlos Da Cruz (FDJ), Bertolini (Domina Vacanze), Pieter Weening (Rabobank) and Nicolas Portal (Ag2R). Km 50: The 4 riders in the break are really hauling! Short, hard pulls. The 10 chasers are 49 seconds back. The peloton led by Discovery is 1min 38sec behind the front 4. 155 riders started. No one pulled out overnight. There has been a constant series of attacks including attempts by Heras, Moreau, Ullrich and Savoldelli. After the last few days the riders know that there is a very good chance that something will get away. But after about 28 km of racing, it's still together. Stage 20, Saturday, July 23: Saint Etienne - Saint Etienne 55.5 km Individual Time Trial. There are so many good riders desperate to either maintain their GC positions or move up that this will be a very exciting time trial. Pereiro bumped Moreau out of the top ten with his Friday break. Can Moreau take it back? He's burning right now since Vinokourov might take his place on the team next year as the top GC guy. He'll want to make a real statement. Can Ullrich take 3min 12sec out of Basso and climb up to 2nd from 4th? Probably not. How about 2min 12sec out of Rasmussen? I'd bet that way. Leipheimer wants Mancebo's 5th place. Will Armstrong finally win a stage or will he do the Tour Walkowiak style (or Balmamion style if you're Italian) and win the Tour without winning a single stage? It's going to be fun. The riders will go off in two-minute intervals in reverse GC order until the final twenty. The twenty best riders will go off every three minutes. All 155 riders who finished yesterday should ride today. There have been no withdrawls since Andreas Kloden quit on stage 17. Weather: Slightly overcast. After Bradley McGee finished he said that it is a bit windy. 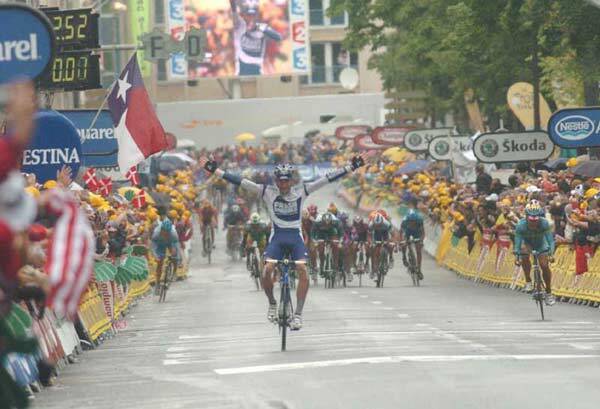 Above left: Armstrong gets his stage win and his 7th Tour victory. Upper right: Ullrich does a superb ride for second in the stage. Bottom: Rasmussen shows the wear and tear of two crashes. 1. Lance Armstrong (Discovery) 1hr 11min 46sec. 46.4 km/hr. 22nd career Tour stage win. 1. Lance Armstrong (Discovery) 82hr 34min 5sec. 41.762 km/hr average speed over the 3,463.5 kilomters covered so far. Oh No!! Rasmussen has crashed on a descent, going head over heels. He's getting his 4th bike change because of problems with his bikes as well as crashes. He's up and going again. Do you want to be the mechanic who has to face Rabobank's Theo de Rooy tonight? Basso is taking the corners in the descents very slowly, very carefully. Rasmussen had to change bikes and lost still more time. 7:13: Ullrich goes. He spent the last few seconds in the starthouse looking straight ahead, breathing deeply. He crossed himself and then took off in his usual monster gear. The Tour has left him looking very fit and lean. He's probably ready now to start the Tour. Rasmussen doesn't have polka dot shorts today, but he does have spotted socks. He'll have to ride like a fiend to hold off Ullrich. He's off. 6:59 AM PDT: We're into the top ten. Landis, 9th in GC just rolled off. He's riding a big gear and sitting right on the tip of the nose of the saddle. Vinokourov went, wearing pink T-Mobile colors, not his light blue Kazakh champion's kit. At the first intermeditate check point (17 km) Bobby Julich went through in 1st place with Hincapie 2nd. 5:20 AM PDT: No change to the top five leaders with 61 riders in the barn. 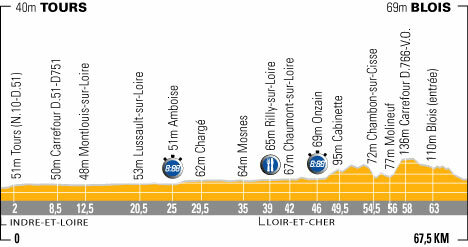 Stage 21, Sunday, July 24: Corbeil Essonnes - Paris Champs-Élysées, 144.5 km. The final stage. A promenade into Paris then 8 blistering laps up and down the Champs-Élysées. The Green Jersey is theoretically still up for grabs, but Hushovd would have to really screw up hugely to lose it. And there are only 2 seconds between Leipheimer and Vinokourov. One of the intermediate sprints or a bold attack might change the final finishing order on the final day. Anyone out there really think Vinokourov will ride the stage without giving it one last shot? There could be a bit of war between the two German teams. Weather: At the start it was 21C (69F). Light rain so far. It was raining in Paris, but it has stopped. We should have dry roads for the finish. 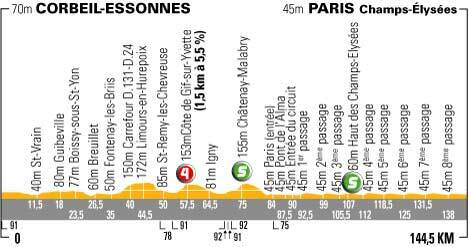 If it's raining in Paris, the race organizers may choose to make the time for the final General Classification when the peloton passes the finish line for the first time. That will keep the race less subject to good or bad luck from crashes on slippery cobbles. 1. Alexander Vinokourov (T-Mobile) 3hr 40min 57sec. 39.239 km/hr average speed. 9. Berhnard Eisel (FDJ) s.t. 11. Luke Roberts (CSC) s.t. 12. Fred Rodriguez (Davitamon-Lotto) s.t. 13. Guido Trenti (Quick Step) s.t. 14. Mauro Gerosa (Liquigas) s.t. 15. Inaki Isasi (Euskaltel) s.t. 16. Nicolas Jalabert (Phonak) s.t. 17. Marcus Ljundqvist (Liquigas) s.t. 19. David Loosli (Lampre) s.t. 20. Laurent Brochard (Bouygues Telecom) s.t. The finish: The race jury has awarded Vinokourov the 20-second time bonus for the stage win. He moves past Leipheimer to 5th place. With a little more than a kilometer to go Vinokourov took off. Bradley McGee closed up to him. With the peloton right on their heels Vinokourov outsprinted McGee. There's no time bonus available so no change in GC for the stage win. Hold on... the Tour web site says he gets the time bonus. Now the race judges are deciding the times. 6 km to go: Bell lap. All together. 10 km to go: 4 seconds. The streets are dry and the speeds are very high. Km 130, 14 to go: The gap is still 15 seconds. Cofidis and Davitamon are chasing hard. 20 km to go: Chris Horner (Saunier Duval) and Bram Tankink (Quick Step) have a good gap, maybe 15 seconds. They are working together perfectly. Km 117: The streets are drying. A group of 9 has gone clear with a lead of about 10 seconds. McEwen's Davitamon team wants them brought back. Km 103: The attacks and the crashes are really starting. Km 94: The race has passed the finish line as the race has 8 laps to go. Lance has won the Tour if he finishes the stage. They go around the first 180 on the Champs very slowly. The well-worn cobbles must be very slick. It was just announced that the time bonuses left in play today are cancelled. Leipheimer keeps his fifth place. Km 88: The race announced that because of the wet streets the winner's final time for the General Classification will be fixed when the Tour crosses the finish line for the first time. But the time bonuses for the second intermediate sprint and final sprint are still in play. Leipheimer has to keep worrying about Vinokourov. Km 84: The streets are really slippery. FDJ's Philippe Gilbert attacked and strung out the peloton. Hincapie crashed on a descent. Popovych goes down behind him. Armstrong stays upright. The peloton slows to let the riders rejoin. Armstorng has words with Gilbert. I think Armstrong wants the peloton to come in together onto the Champs. Km 75: Gerolsteiner is at the front to make sure Vinokourov doesn't make any trouble in the first intermediate sprint. Armstrong has left the front. Bam! Vino goes with a Gerolsteiner rider on his wheel. Now 4 Gerolsteiner riders including Leipheimer are on his wheel. Vino goes again with Leipheimer on his wheel. Vino takes it as Leipheimer can't come around and gets the two bonus seconds difference between them. Looking at the time trial time differences Leipheimer now leads Vinkourov by a few thousandths of a second. Km 58: The roads are still wet. Armstrong and Basso ride at the front side by side, talking, riding casually. 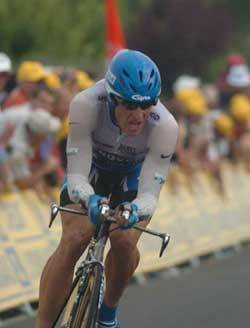 Armstrong takes the final climb of the 2005 Tour, but it was uncontested. Km 32: So far it's been an easy, jovial ride. All the riders are smiling and taking it easy. Alexandre Moos (Phonak) crashed, but got a new bike and is back in the pack. 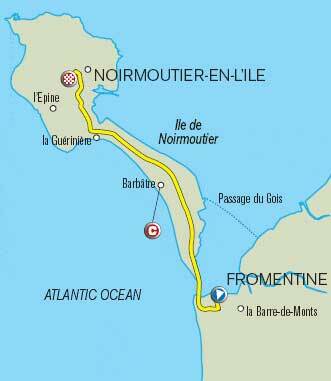 October 28: The 2005 Tour de France route was revealed today. It will have 21 stages covering 3,584 kilometers. No prologue to start this Tour. The first stage will be a 19-km individual time trial. Stage 4 will be a 66 km team time trial. Overall there will be more time spent racing in the mountains and less against the clock. 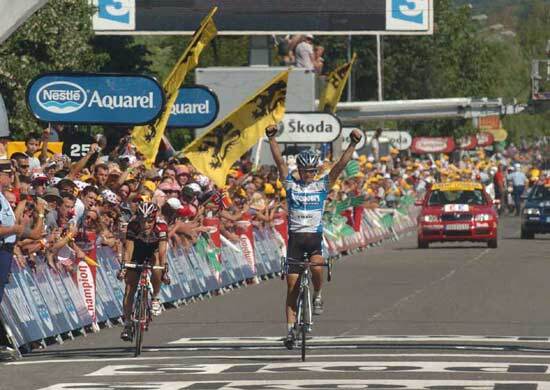 Running from Saturday July 2nd to Sunday July 24th 2005, the 92nd Tour de France will be made up of 21 stages and will cover a total distance of 3,584 kilometers. 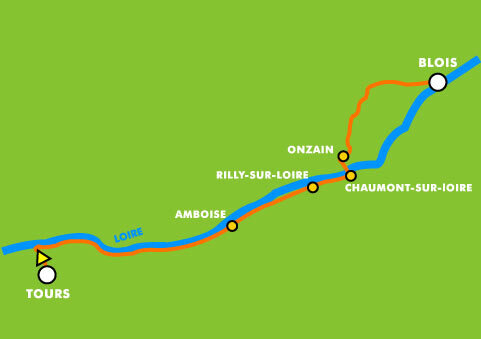 * 9 new stop-over towns: Fromentine, Noirmoutier-en-l'Ile, Les Essarts, La Châtaigneraie, Chambord, Gérardmer, Miramas, Agde et Lézat-sur-Lèze. Davitamon-Lotto: 5 Belgians (Mario Aerts, Christophe Brandt, Axel Merckx, Wim Vansevenant and Johan Vansummeren), 2 Australians (Cadel Evans and Robbie McEwen), 1 Dutchman (Leon Van Bon) and 1 American (Fred Rodriguez). Fassa Bortolo: Lorenzo Bernucci, Paolo Bossoni, Fabian Cancellara, Claudio Corioni, Juan Antonio Flecha, Dario Frigo, Massimo Giunti, Volodomyr Gustov, Kim Kirchen. Illes Balears: Francisco Mancebo, Vladimir Karpets, Alejandro Valverde, David Arroyo, Chente García, Xabier Zandio, Daniel Becke, José Luis Arrieta and Isaac Gálvez.